I’m going to take you back in time to July 13, a day when a once-in-a-leg event took place. We awoke that morning to a strong breeze blowing NOAA Ship Fairweather towards the dock in Nome. 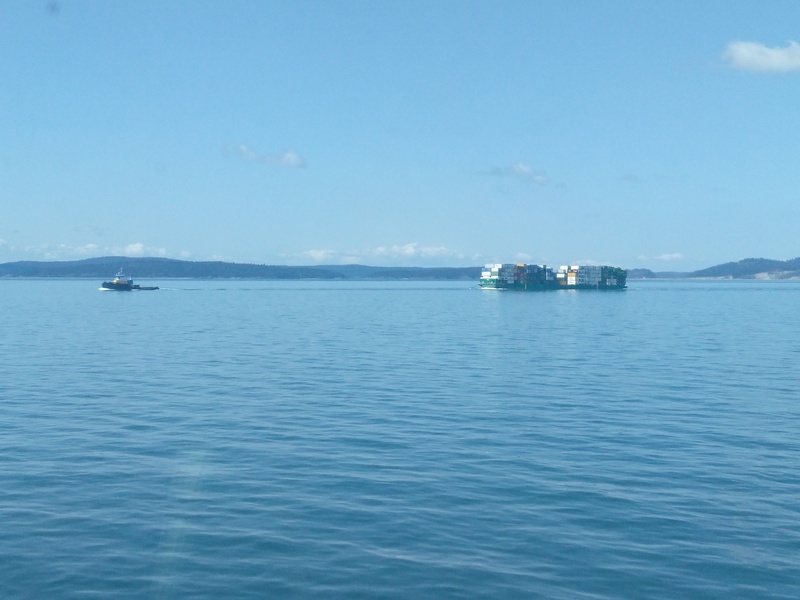 Normally a breeze blowing a docked ship is fine, but that day was the start of our long awaited departure to Point Hope! 0900 was quickly approaching, and Ensign Abbott was excited for his first opportunity as conn during an undocking process! With XO Gonsalves at his side for support, he stepped up to the control center outside the bridge on the starboard side. As you may or may not know, taking the conn is no small feat. “Conn” is an old name for the conning officer, or controller of the ship’s movement. The conning officer used to stand on the conning tower, an elevated platform where the ship’s movement could be monitored. Although the conn no longer stands on a conning tower, the name and role remain the same. The conn makes commands to the rest of the ship and, during docking and undocking, controls the two engines, two rudders, bow thruster, and the lines attaching the ship to the dock. Each part causes the ship to move in specific way and has a very important function in undocking. ENS Abbott did a great job deciding which parts of the ship to maneuver which way and when. The process was so technical that I cannot begin to describe it. 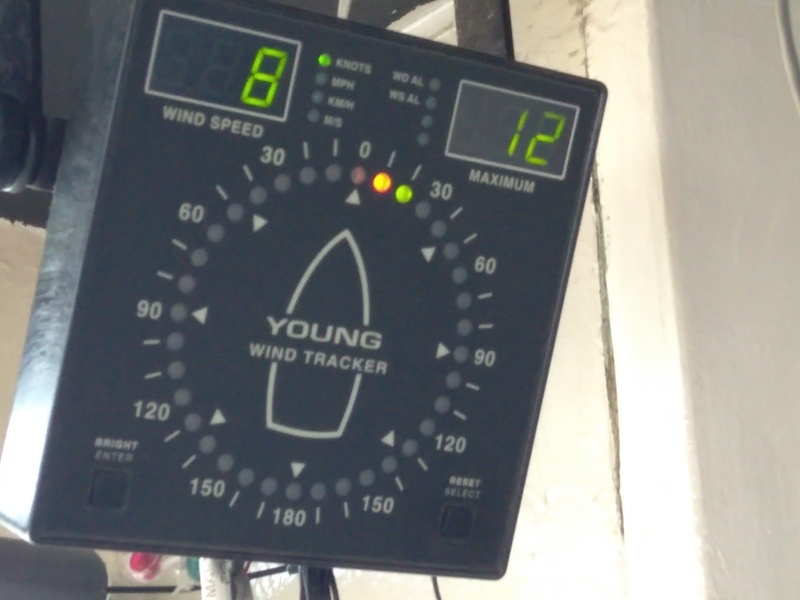 However, the persistent westerly wind just kept drifting the ship back into its docking station. Every time we got the ship positioned the way we wanted, it would push right back into its starting place. The situation turned hazardous because we had a giant barge docked in front of us, a fishing vessel docked behind us, and the wall of the dock to our starboard side. The only direction we could go without danger of crashing into something was to the left. Unfortunately you cannot move a ship side to side very far without forward or backward movement, so there are strategies for moving the ship in a forward to backward motion while simultaneously moving left or right. In our situation, the best thing to do was to slowly back the ship out while swinging the stern end into the harbor. Once out enough to account for the westerly wind, the engines could push forward and the ship could safely exit the harbor. Unfortunately all did not go as planned and when the engines went forward, the wind pushed the ship so far towards the dock in a short amount of time that the stern narrowly missed a collision with the wall of the dock! It was a close call! The conn was unlucky in the fact that he was assigned control of the ship during weather conditions no sailor would elect, but he did his best and it was a great learning lesson for everyone! Fast forward to July 19. The members of the NOAA Corps new to ship docking and undocking had a brief in the conference room. They discussed all of the physics involved in the undocking from the week prior, debriefed the challenge the wind posed, and reviewed the different types of maneuvers for undocking. Then they shifted the conversation to planning for the next day’s docking maneuver. XO Gonsalves, with a vast array of unique skills in his toolbox, turned on a PlayStation game that he created for his crew to practice docking and undocking! Docking a ship is a skill with the unique problem that you cannot simply practice it whenever you want to. The only attempt offered to the crew during this leg was on the morning of July 20. It was a “one and done” attempt. Lucky for them, XO thought outside the box! With the video game, they could practice as often as they wanted to and for as long as necessary to get the skill down. The challenge presented to the crew was to dock and then undock the boat seen in the photo above eight different times with varying obstacles to work through. Examples of obstacles were having a small docking space, turning the boat around, and wind adding a new force to the boat. Three controllers were needed for the job. 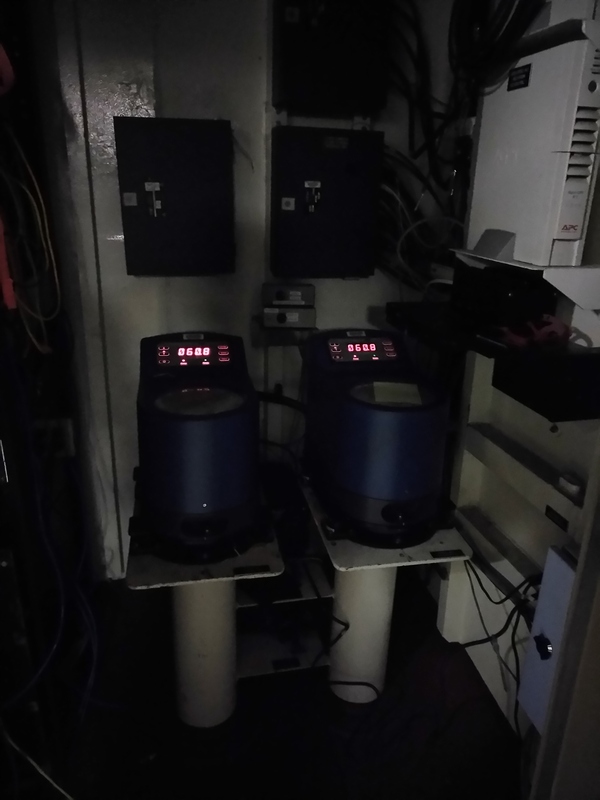 The first controller, and the little tiny person at the front of the boat, controlled the bow thruster. The bow thruster could push the boat left or right in a jet propulsion-like manner. Using the bow thruster on the port side pushed the boat right, and using the bow thruster on the starboard side pushed the boat left. The XO also assigned this person the roll of the conn, so they had to call out directions to everyone playing the game. The next person controlled the engines. This was a difficult task because there is a port and a starboard engine, and each engine can go forward or backward. The conn could give a simple order like “all ahead” or a more difficult order like “port ahead, starboard back” (trust me, that one is not easy). The last person controlled the rudders. The rudders worked in unison and could be turned right or left. The rudders can be fine-tuned in reality but in the game, due to the controller’s limitations, we used the commands of “half rudder” and “full rudder” to choose how significantly the rudders should be turned. You can see a small clip of the game in action below. Turn up the volume to hear the conn. As a reminder, the Corps members participating are learning the process, so you may hear a variety of commands as they fine tune their vocabulary to use more specific language. On the morning of July 20, the docking process was smooth with no surprise forces at play on the ship. The NOAA Corps did an excellent job with the maneuver. As soon as we thought we would get a chance to relax, a food order arrived with 2,700 lbs of food that needed to be hauled from the top deck of the ship down to the bottom. Horizontal forces affecting the ship were no comparison to the vertical force of gravity pulling all those boxes down towards Earth, but we used an assembly line of 20 people passing boxes down the stairwell and we all ended the day with a good workout! It seems fitting to begin my last blog with the story of undocking the Fairweather in Nome at the start of the leg. This is not the end of my Teacher at Sea journey but the start of my work, integrating my personal experience into something relevant for my students in a physical science classroom. Since returning home, I completed my first media interview about my time at sea. Ironically teaching others about myself led to my own epiphanies, namely refining my “why” to becoming an educator. I told Amanda, my interviewer, how I spent my childhood soaking my shoes in ponds trying to catch frogs, harvesting new rocks for my shoe box collection under my bed, and following the streams of water every April when snow melted away. I grew up with a curiosity for all things natural and scientific. Science classes were simply an outlet for my inquisitive mind, so it was easy to be engaged in school. Below are a few photos of me in high school, memories of times that inspired my love for the ocean. That natural wonder, excitement, curiosity I had for the world around me as a child and young adult…that’s what I want to instill in my students. My experience on the Fairweather helped me find new tools for my “teaching toolbox” and new ideas for my curriculum that I hope will inspire more students to become curious about their worlds. You’re never too old to discover the intrigue of the natural world. When you begin to understand that the purpose of science is to explain what we observe, your desire to uncover the secrets will grow! The ability of a ship to make 3,000,000 lbs of weight float on water, that is intriguing. The idea of using sound waves, something we interact with constantly on land, under the water to map what we cannot see, that is amazing. 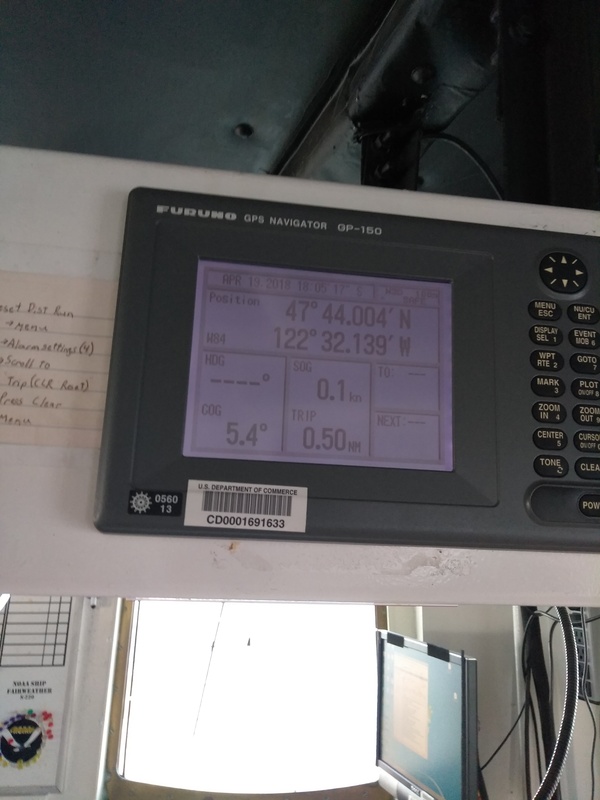 Collecting an array of data that, to the untrained mind seem unrelated, and putting them together into a chart used by mariners all over the world, that is revolutionary. 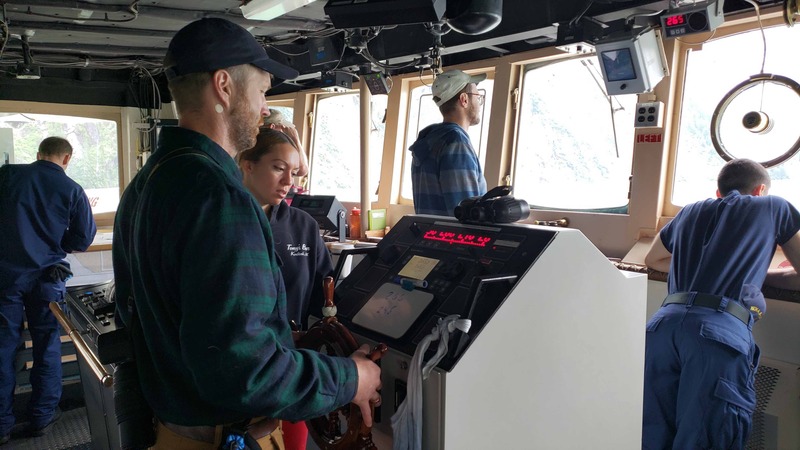 NOAA hydrographic ships connect science and the economy in a way not dissimilar to how I hope to connect education and career for my students. This experience inspired me in ways beyond my expectations, and I cannot wait to share my new knowledge and ideas in my classroom! 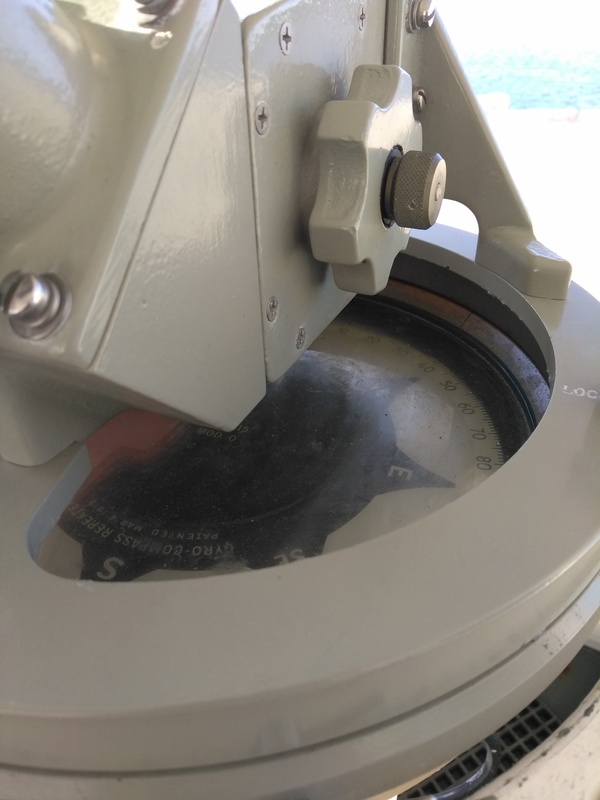 The Multibeam Echosounder on the ship obtains ocean depths accurate to 10 centimeters. The average depth of the ocean is 3,700 meters, or 370,000 centimeters, according to NOAA. That is an average percent accuracy of 99.997%! The harbor at Pelican, Alaska. “We’re a part of history!” This notion, shared by a colleague on a launch yesterday, brings home the importance of the work of this team and NOAA’s Hydrographic Branch. Lisianski Inlet was last surveyed in 1917 by lead line! The charts of the inlet were old and not likely accurate. 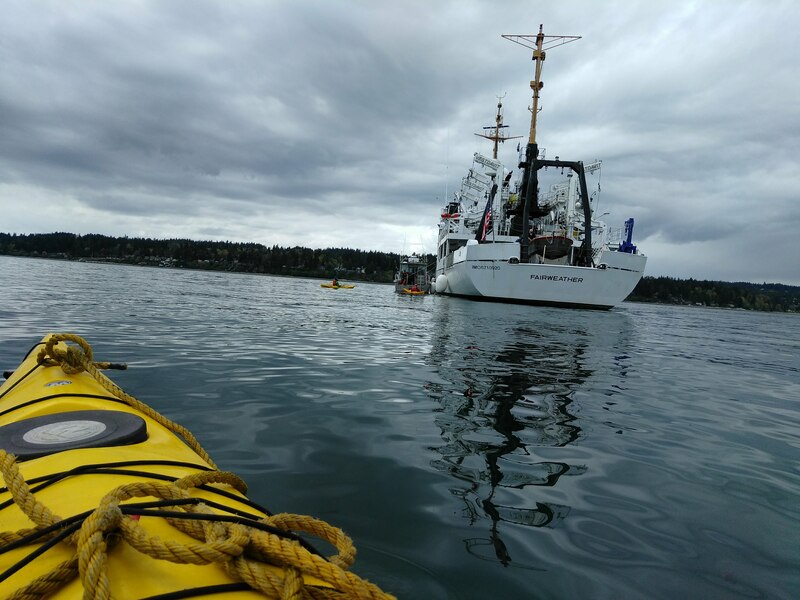 This week – fresh data has been collected by Ship Rainier and her launches to bring the next century of mapping tools below their shores. Pelican Harbor in the town of Pelican, Alaska was last surveyed between 1970 and 1989.–until we surveyed it yesterday with Rainier Launch RA-3. 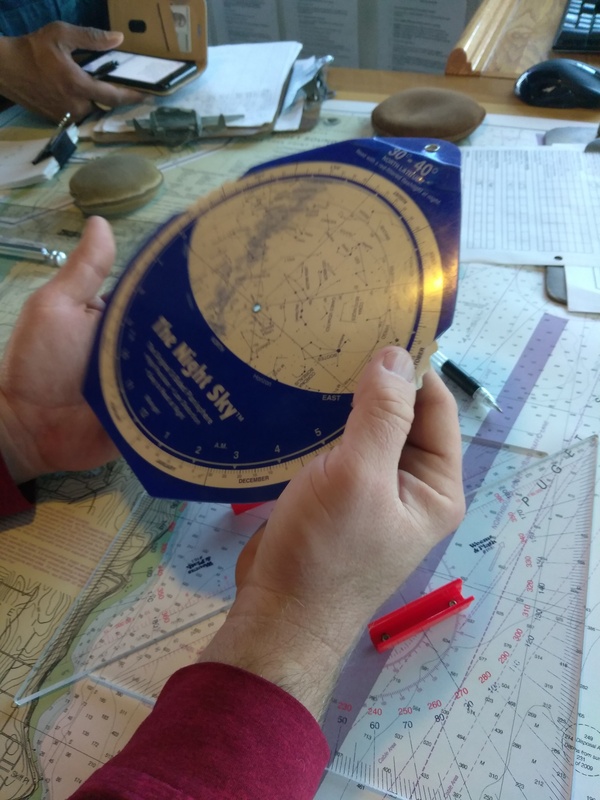 Our team drove in and out between each of the docks in the harbor, carefully pinging sound waves off of the floor of the harbor to construct a new digital map of the bottom. Guys on a mission…walking to pickup the HorCon. This is the Horizontal Control station, or HorCon, setup on the breakwater at Pelican before we took it down. Part of our task yesterday, in addition to conducting MBES survey from our launch, was to dock in Pelican and retrieve our HorCon (a GPS reference radio setup on land that we have used there all week). As we walked through the very small town carrying two car batteries in backpacks, a pair of antennas, tripods, and other gear back to the launch – surely people were interested in what we were up to. Several people stopped to chat as we made our way from the pier, along the boardwalk, and down to the docks to go back to our launch. People asked who we were – and if we were the NOAA team that was in town. There was much appreciation expressed to NOAA for the work being done in the inlet to update the nautical charts. Here in Pelican, the water is the primary mode of transport. Accurate nautical charts provide security and safety. Here is a bit of history on the city! 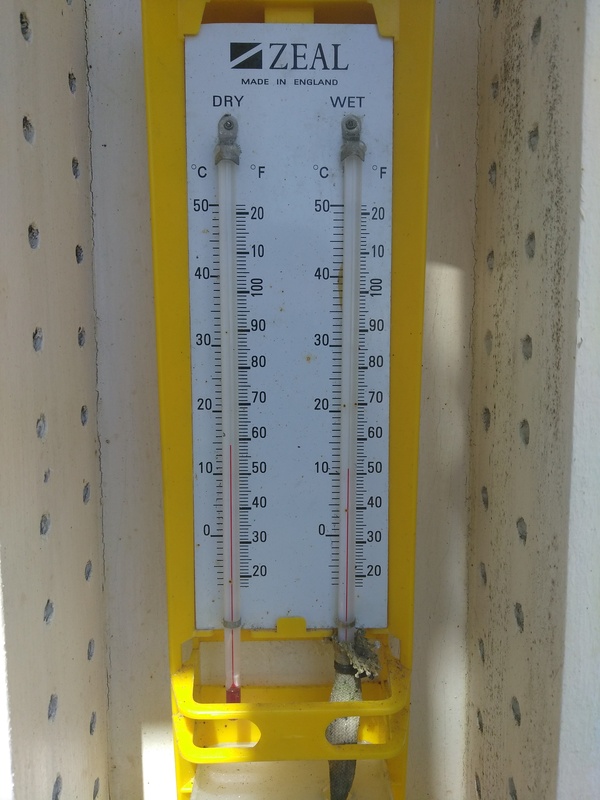 It’s a comfortable place, here in Pelican! There are no roads to Pelican. A few cars are in town – to pull trailers and move equipment. But the primary mode of land transport is four-wheelers. The ‘main street’ is really a raised boardwalk that runs along the rocky shore – and is the heartbeat of the community. Folks that live up or down the inlet from the town get there in small launches – there are no roads. A ferry comes to Pelican twice a month and is how cars and trucks come and go here. A seaplane comes through a few times a week—often bringing tourists in and out – and the mail. It’s a beautiful spot centered in a small inlet on the edge of the Pacific Ocean. The fastest transportation in many parts of Alaska. A house up the shoreline from Pelican. It’s mission accomplished for Lisianski Inlet! 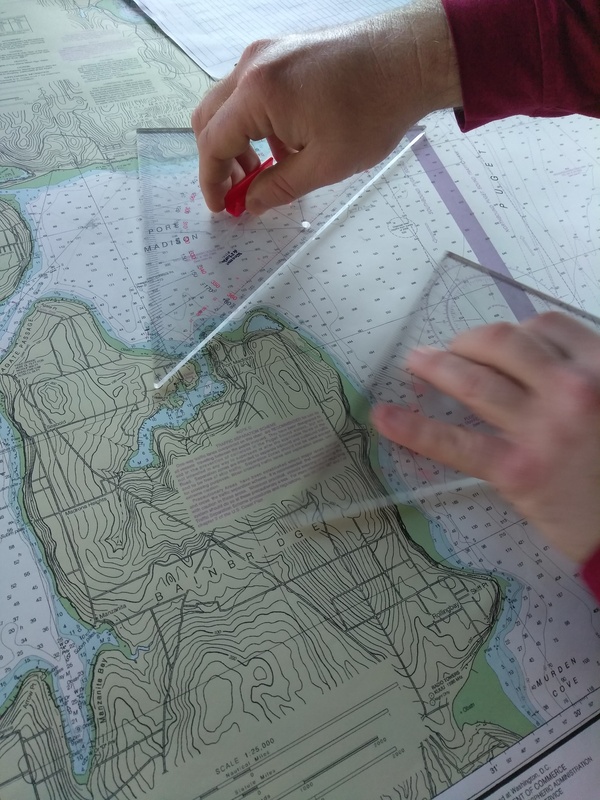 Nautical charts are broken up into sheets. And within each sheet, areas are broken down into smaller polygons for data collection. Each launch (small boat), as well as the ship itself, can bring in multibeam data with the equipment mounted on each hull to complete plotting polygons and eventually complete sheets. 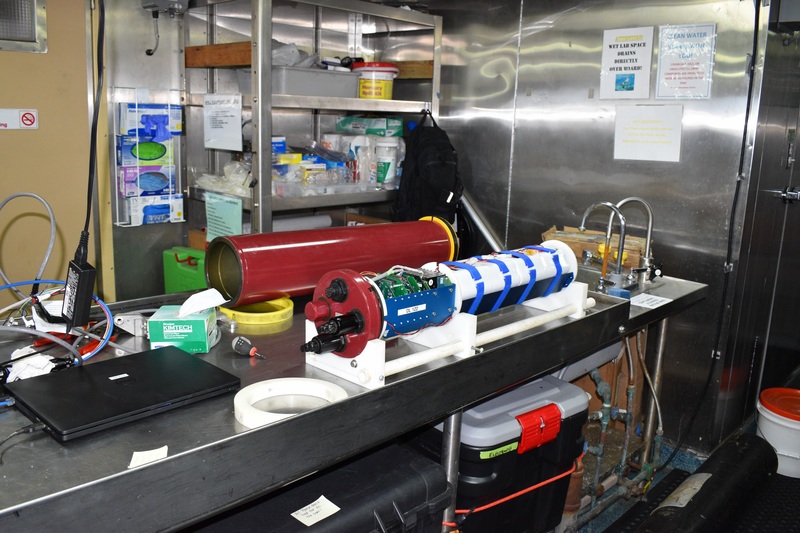 The hydrographic survey team is working away today in the plot room and on “the holodeck” of Ship Rainier (an office area on the top of the ship behind the plot room) processing the data we have collected the past several days. A combination of ship and launch multibeam data in addition to bottom samples and shoreline updates have been collected. Now the work of the scientists continues and becomes data processing. Part of the hydrographic team on the holodeck. As the data is combined, it is reviewed and refined to make a complete picture of the survey area. 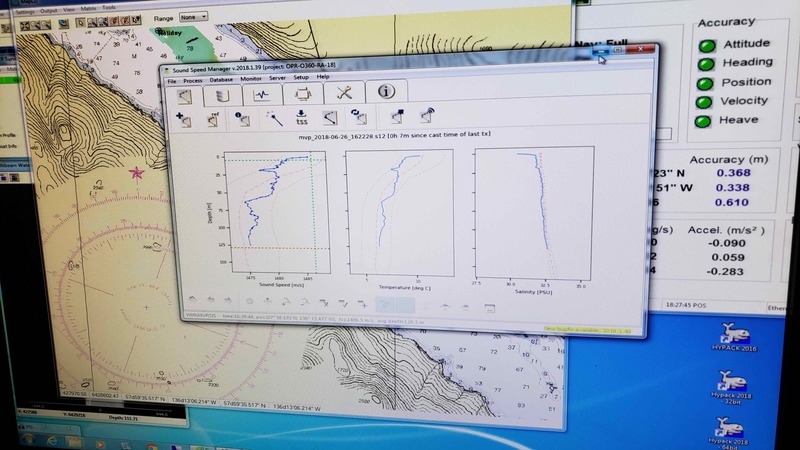 Once the team on the ship has completed their work, the data goes to the Pacific Hydrographic Branch of the Office of Coast Survey of NOAA. Here, the PHB team reviews that data again and assures it meets the specifications and standards needed to become finalized for use. From PHB, the data is passed to two places. One is the NCEI (National Center for Environmental Information) office. They archive all of the raw and processed data including the digital surfaces themselves and the descriptive reports written by the hydrographers here. The data also goes to the Marine Chart Division, an office of NOAA Coast Survey. Here is where the nautical charts are produced in both ENC and RNC (electronic and paper versions). It is this branch that publishes the data for use by mariners and the general public. Anyone can see the charts at nauticalcharts.noaa.gov (try the “Chart Locator”). Here is a finished chart we are using to navigate today. Notice the two buoys in purple and green on the chart, and the narrow space between them. This is the view from the flybridge as we approach these same two buoys that are indicated on the chart. Tyanne Faulkes is a hydrographic scientist with NOAA. During this leg of the trip, we have a visiting scientist from NOAA’s is here on board. Tyanne Faulkes works as a physical scientist for the Pacific Hydrographic Branch of NOAA. She is a part of the team that processes the data from the hydro teams on NOAA Ship Rainier and NOAA Ship Fairweather. 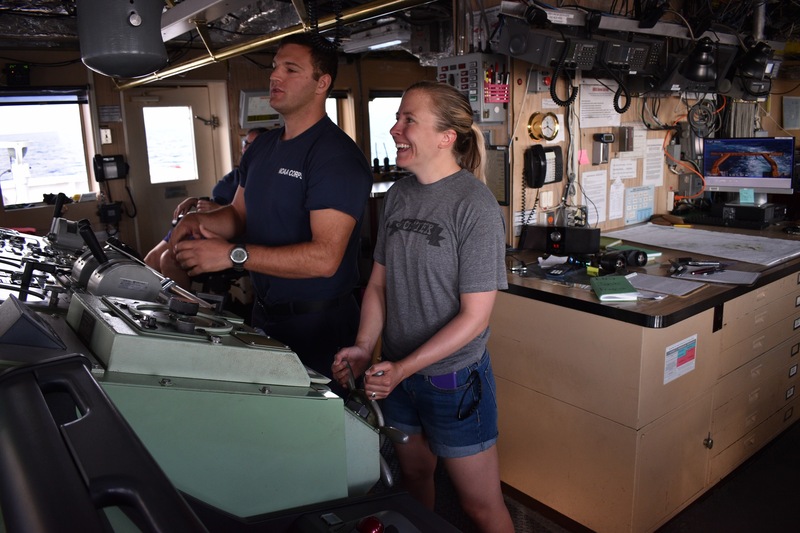 Her job is to assure that the data meets NOAA’s specifications–so that they can provide evidence of dangers of navigation and accurate depth information for all mariners. Tyanne loves to be involved in making maps of the sea floor – and getting to see things others have not seen before! She loves that NOAA provides data for free to scientists around the world. Her job includes not only desk work, but also opportunities to make many mapping trips to understand where the hydro data comes from. Ms Faulkes has a bachelors degree in geography and GIS. It was a paid internship just out of college with NOAA that initially brought her to this work. And – she has a ton of fun with what she does. As a kid, Tyanne loved oceanography. Her GIS education tied well with the internship – and it all came together to take her where she is today! When she’s not chasing the bottom of the oceans, Tyanne also loves to climb mountains! Understanding the concept of an algorithm that can save one hours of work is a very good asset. “I wish in college someone would have taught me how to do this!” One easy example is a bulk file renaming tool that the launch teams use. After collecting 50 some separate files of data in a day, this tool will take the individual file names and append any number of things to the filenames – all automatically. Want to get involved? 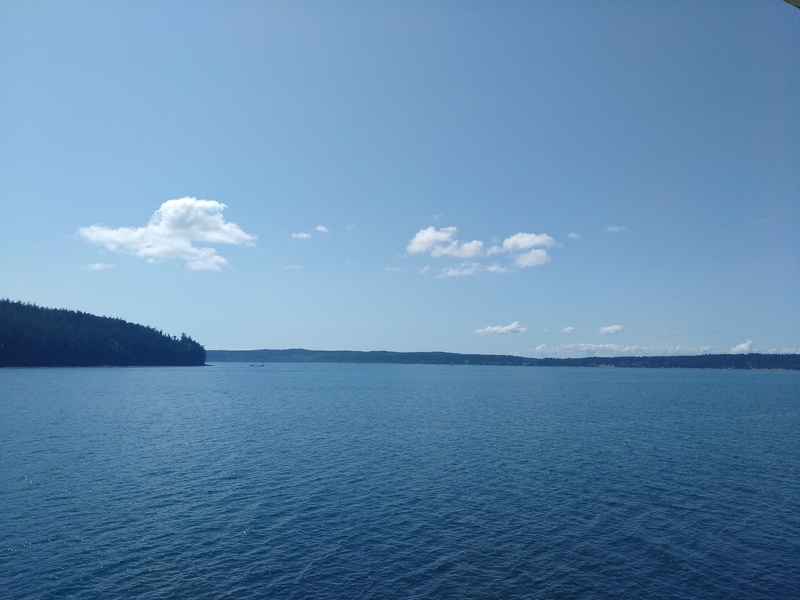 Next week, Tyanne and her team at NOAA’s Western Regional Center at Sand Point in Seattle, WA are hosting an annual camp for middle school and high school students! Students from across the US can apply to come to this camp each summer and have great experiences learning all about oceans and hydrography! 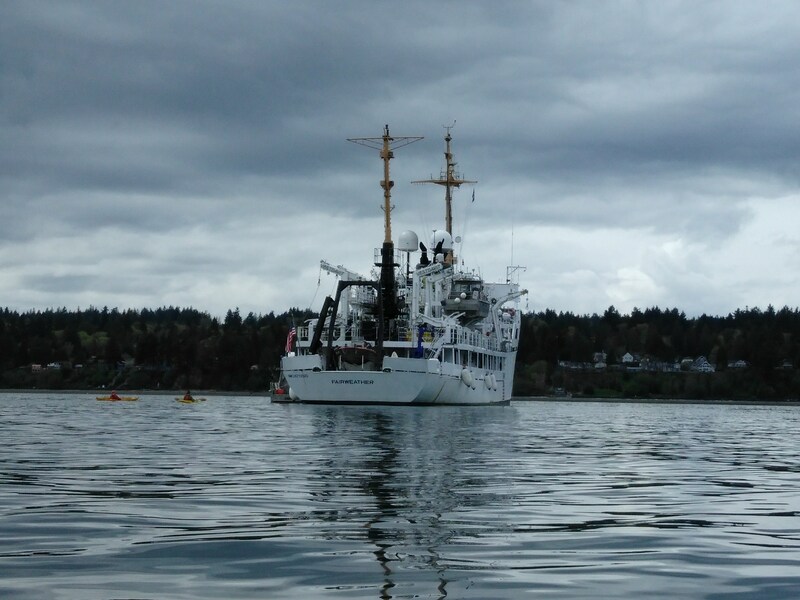 Check it out on the web: NOAA Science Camp – Washington Sea Grant. A typical longline fishing boat. The fishing lines get spread out behind the boat from the large booms on either side. 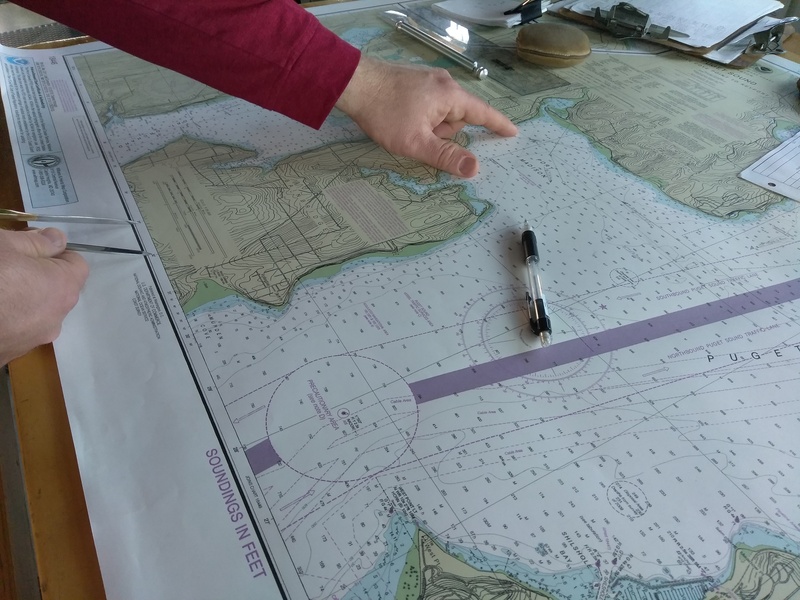 The ultimate focus of Rainier is to assure accurate navigational charts are available to all mariners. This task is critical to the safety of many industries. About 80% of all the overseas trade in the US (by weight) is moved over water. Here in SE Alaska, it appears the largest industry is commercial fishing. 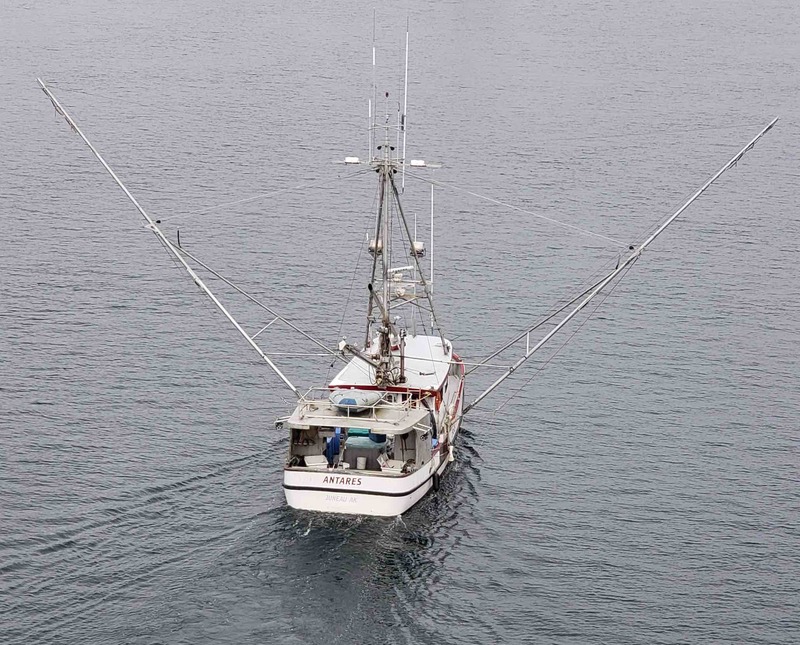 Many boats fish both with nets and long lines to catch halibut, rockfish, cod, and several varieties of salmon. Another major industry here is certainly tourism. As we conduct our work, we often see very large cruise ships. It’s an interesting juxtaposition to be in a narrow inlet surrounded by mountains, ice, and wildlife and then come across a large ship. We passed the brand new ship Norwegian Bliss around 11 PM on our transit to Tracy Arm. This ship is 1,082 feet long, carries a crew of 2,100 people and has a guest capacity of 4,004 people! The safe navigation of all of these vessels depends upon the accuracy of charts produced by NOAA. The cruise ship Norwegian Bliss as we passed her port to port in the evening. The freely available charts offered by NOAA are created with three essential steps. First, the bulk of the depth data in this area is measured with MBES (Multi-Beam Echo Sounder). This creates a three-dimensional digital image of the bottom. Secondly, important features to navigation that are shallow are best identified by our launches which travel along the shorelines and inspect for rocks, ledges, and other potential dangers. The locations of features are identified by GPS location and charted digitally by hydrographers on each launch. Thirdly, bottom samples are collected by launch crews to confirm the type of material present on the bottom. The MBES systems aboard Rainier and the launches come from Kongsberg Maritime. Two transducers (devices that transmit and receive) work in tandem. The transducer that is oriented front to back sends out an array of sound signals in a wide beam. The width of the beam on the sea floor depends directly on the depth – deeper water allows the beam to spread farther before reflecting. The transducer that is oriented side to side in the water receives a narrow swath of the ‘pings’ of sound that were transmitted. The time it takes any ping to get to the bottom and reflect back to the ship is recorded. The greater the time, the larger the depth. This shows the position of the MBES on the bottom of one of several launches. This is the pair of MBES transducers on a launch, looking from the bow towards the stern. This image, courtesy of NOAA, depicts an MBSS beam below the ship and the mapped results off the stern. A couple of issues provide challenges to this technique. One, the speed of sound in water depends on several factors. The salinity (concentration of salt in the water), the conductivity (how easily electricity passes through the water), and the temperature each fluctuate as the depth changes and affect the speed of the sound waves. As hydrographers receive data, the system has to account for these changes in speed to produce an accurate depth measurement. One way to do this is with a static CTD sensor. This device is lowered from the launches all the way to the bottom as it measures the speed of sound in the water. It provides a set of three charts as the depth changes which are used to adjust the time data from the MBES accordingly. There is also a version of the CTD, called a MVP (Moving Vehicle Profiler or ‘fish’), that can be pulled behind Rainier as we are moving and take dynamic data. Here is a NOAA article on hydrographic surveying. Here is further explanation of MBSS. Here the crew lowers the profiler “fish” into the water. These three plots represent the speed of sound, temperature, and salinity (from left to right) vs. depth (on the vertical axis). A second issue is GPS signal drift. Over time, the location information can shift slightly. To account for this potential problem, the scientists place a HORCON (Horizontal Control) station onshore in the area where they are mapping. I described this tool in my previous post. Another interesting technology that is currently being developed is called “backscatter” mapping. Here scientists look not only at the time it takes the sound waves to bounce back to the transducer, but also at the quality of the return signal. Different materials on the seafloor reflect the sound differently – hard surfaces like rocks have a sound signature that is much different than soft surfaces like silt or plants. NOAA is continually improving the tools they use to learn! Here is an example of the chart that we are updating in Tracy Arm. I had a chance to take the helm yesterday! It’s interesting how sensitive the steering on this large vessel really is. The rudders are able to turn from “amidships” or their center position, up to about 35° to either side. But while traveling at about 8 knots, we tend to use a maximum of about 5° of rudder to alter the ship’s direction. 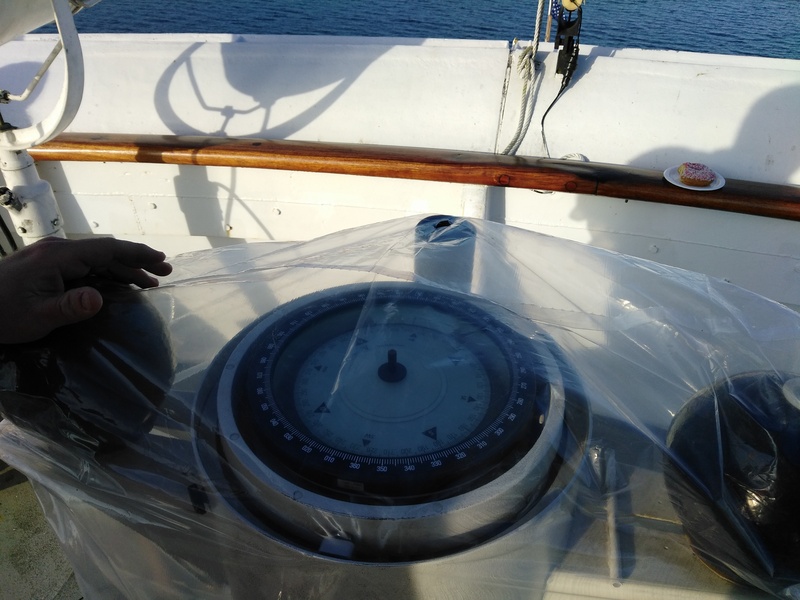 While at the helm, we keep close track of the heading (compass bearing) of the ship as indicated by the gyro compass and magnetic compass on board. Then we provide steering input to hold the ship to the course ordered by the CONN. I had the chance to help steer around several icebergs as we transited into Tracy Arm. Careful attention to detail – and willingness to promptly follow commands make for success! My opportunity to take the helm of Rainier. I also took an opportunity to head out in a kayak from the ship where we are anchored! Two of my new colleagues and I paddled across this bay and had a great chance to look very closely at pieces of ice. The ice is really beautiful and forms many interesting shapes. The quiet of the bay – hearing only the distant waterfalls, birds, and our paddling was beautiful! 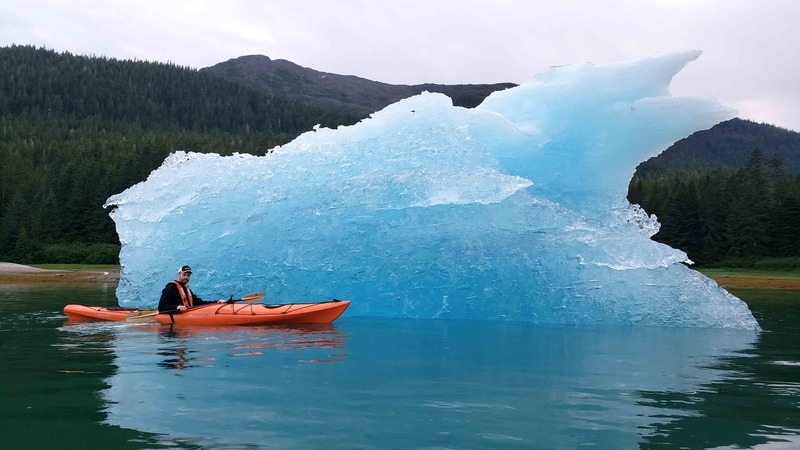 This piece of ice drifted through Tracy Arm from the glacier. It was temporarily ‘grounded’ on the bottom by the receding tide. It’s crazy to consider the ice we were seeing may have been formed thousands of years ago in the glacier – and it just now melting as it floats away. President Thomas Jefferson signed a mandate in 1807 ordering a survey of the nation’s coasts. This fundamental task is always ongoing, with 95,000 miles of US Coastline. About 90% of any floating piece of ice will be submerged below the salt water. Because the density of frozen fresh water just slightly less than salt water, the ice floats very low in the water! Read more here! 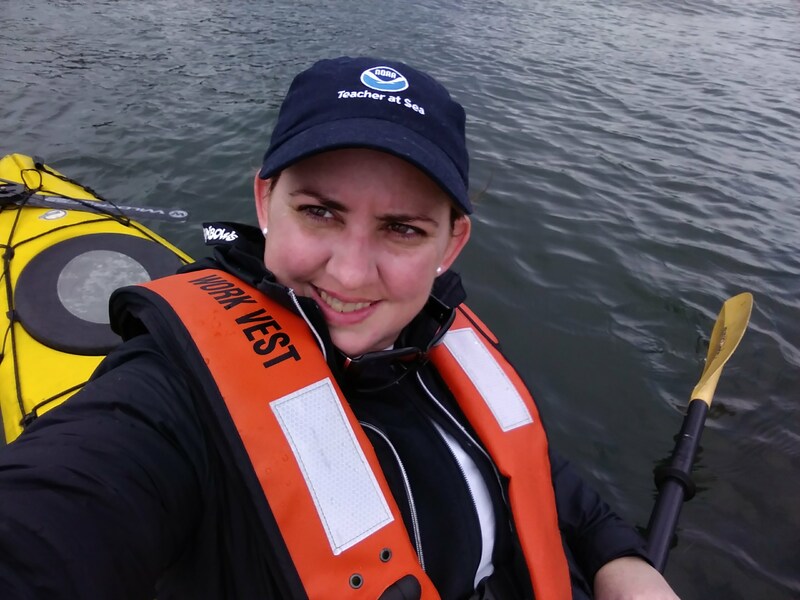 I’d like you to meet HST (Hydrographic Survey Technician), Amanda Finn! Ms. Finn has been with NOAA since last September – and started working aboard NOAA Ship Rainier in October of 2017. As an HST, Amanda works with the team of hydrographers to collect MBES data from either the ship or any of the launches. Amanda graduated from the University of Connecticut in 2016 with a bachelor of science degree in GeoSciences and a minor in Oceanography. 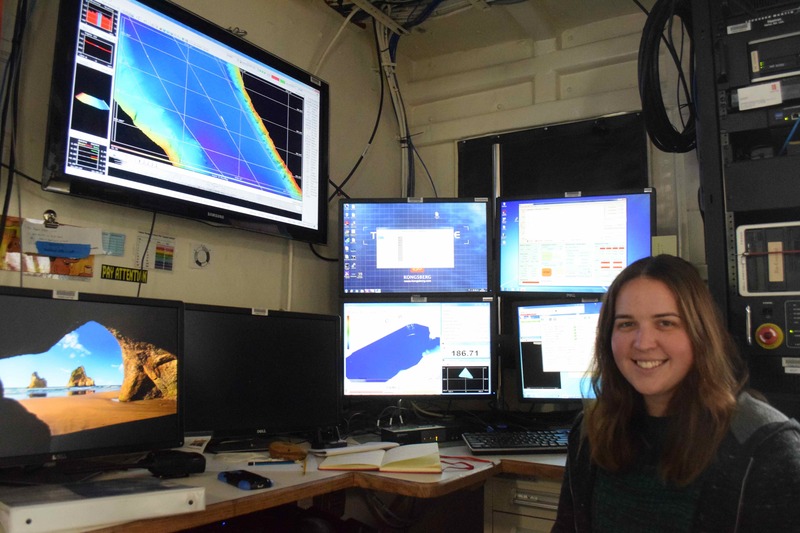 At the end of her college experience, she knew that seafloor mapping was her passion but wasn’t sure how to make that into a job. But it all came together when she found NOAA through a friend of a friend! HST Amanda Finn with recently acquired depth data for Lisinaski Inlet! One positive challenge Amanda shares working here on a hydro ship is developing an understanding of systems integration. Many different pieces must come together to create the finished charts. 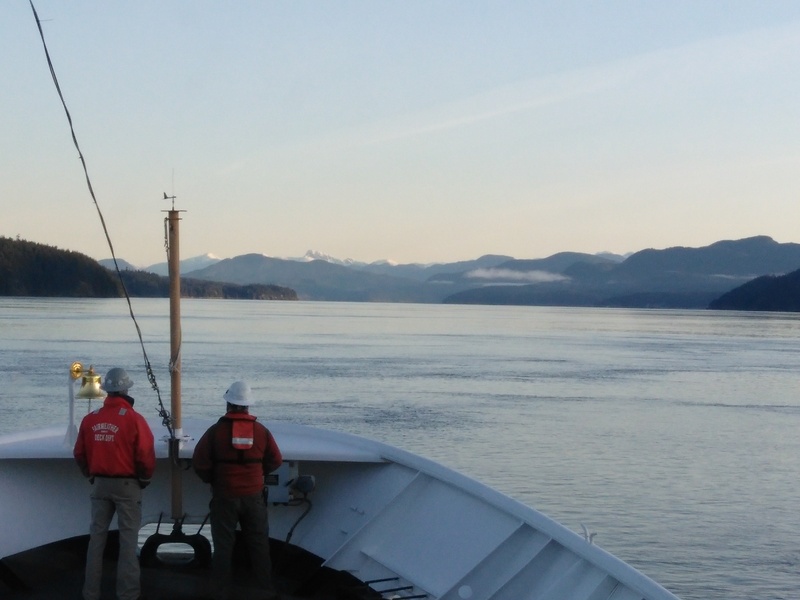 The people aboard Rainier make the experience very positive! The passion for seeking the unknown is the drive to continue! This morning I spent some time on the bridge with the officers. 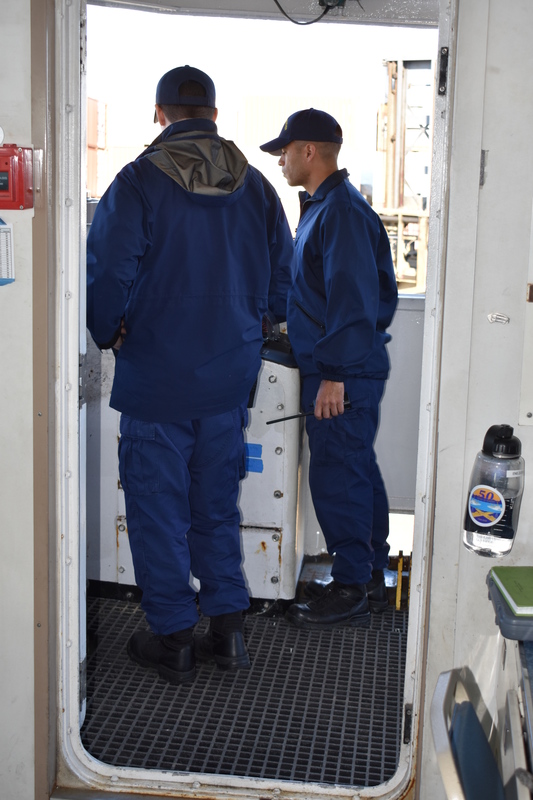 NOAA Ship Fairweather is manned day and night with men and women making sure we are safely on course. 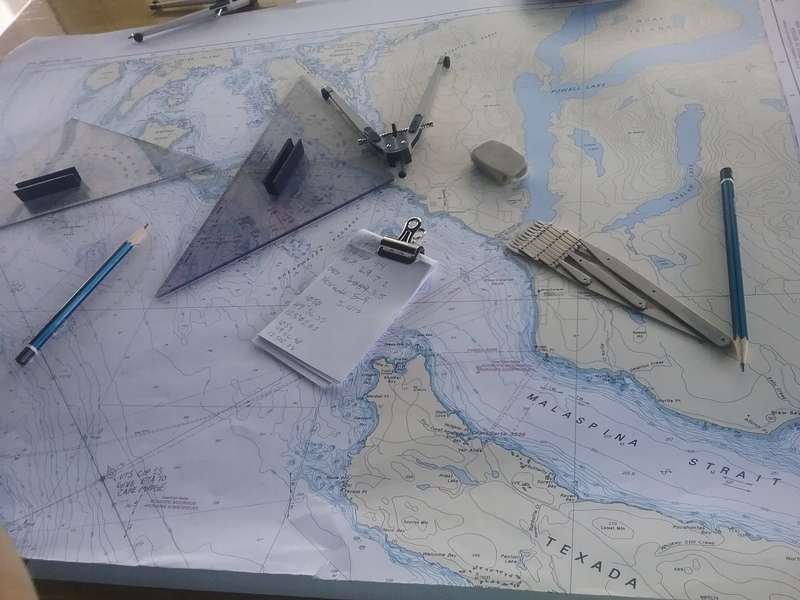 While the ship is equipped with GPS, the ship is also full of experienced mariners who plot our position on paper nautical charts to help guarantee the technology is working correctly and helps the officers orient themselves with the area. Every 15 minutes, an officer plots our position either by using GPS coordinates, radar returns, or fixed land triangulation using an alidade. This last mode of determining our coordinates, at least to me, is the most difficult. 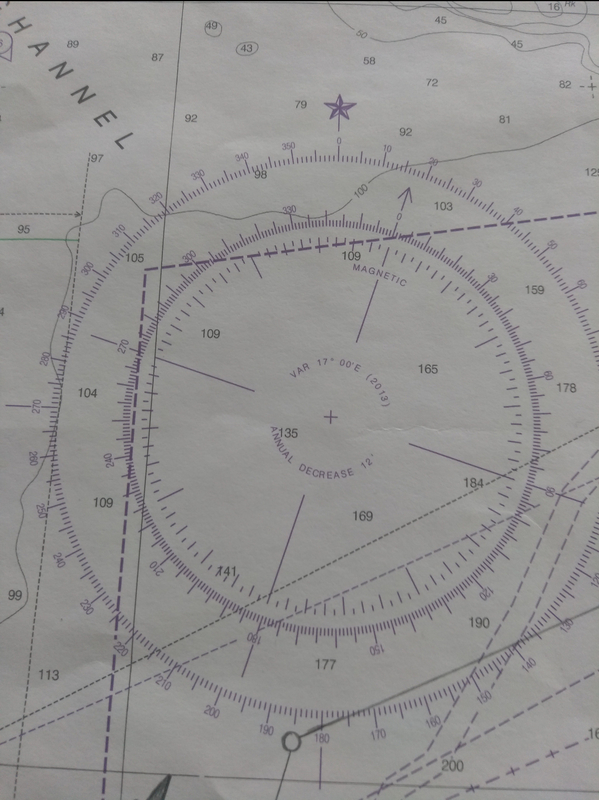 You must use 3 fixed land points on either side of the ship, determine their direction using the compass on the alidade and then using sliding protractors plot our triangulated position on the chart. Both Executive Officer (XO) Michael Gonsalves and ENS Cabot Zucker have been incredibly helpful in teaching me these different plotting techniques. XO Gonsalves in the foreground and ENS Zucker in the back plotting our course. Today we are headed to the Queen Charlotte-Fairweather Fault System. 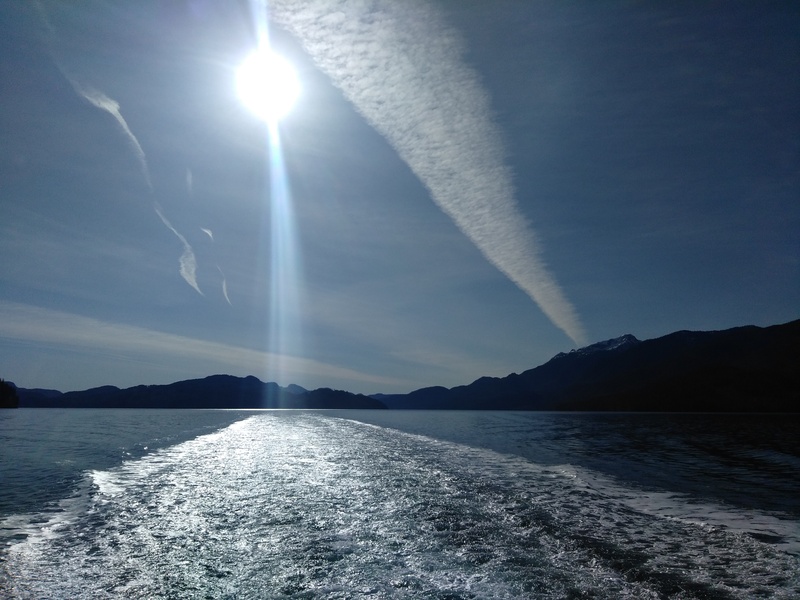 This is a strike slip fault line extending 746 miles off shore of Vancouver Island to the Fairweather range in southeast Alaska. 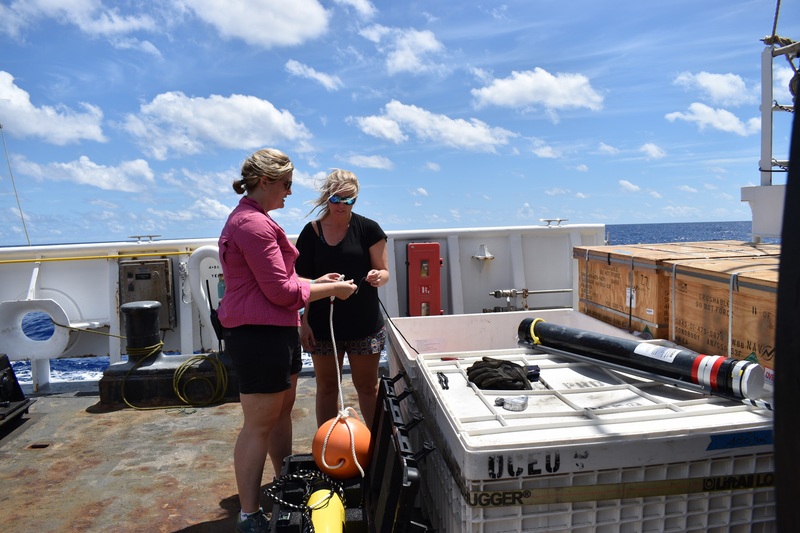 USGS has partnered with NOAA Ship Fairweather to help to create part of a comprehensive map of one of the fastest moving underwater tectonic plates in the world, moving of a slip rate of 2 inches a year. Over the next 24 hours they will survey the area using multibeam sonar to help complete the mapping which as taken almost 4 years to complete. 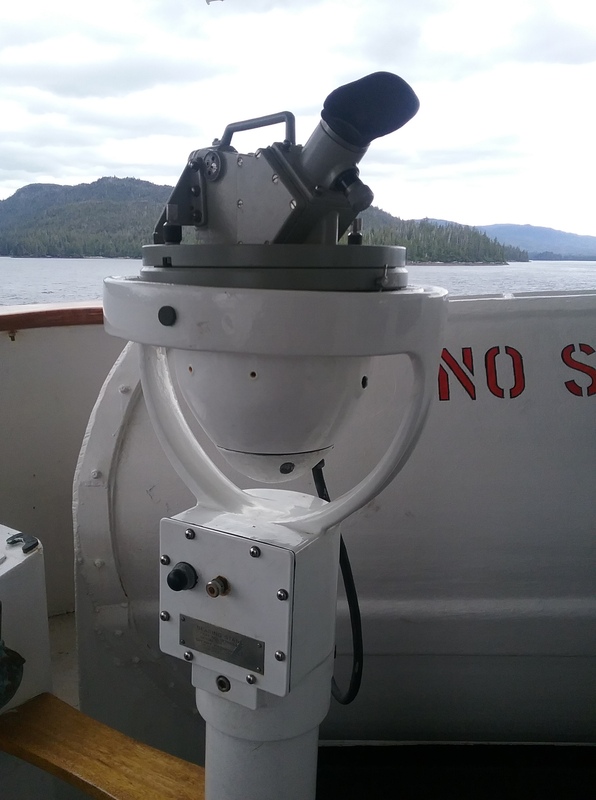 To start this, the survey team had to deploy a Moving Vessel Profiler (MVP) into the water. The MVP follows behind the ship and by detecting water temperature and salinity of the water, the MVP can then determine the speed of sound in water needed to accurately detect the sea floor. With this knowledge the survey team can correctly calibrate their sonar to map the sea floor. Below you will see Sam Candio and Simon Swart of the survey team deploying the MVP. 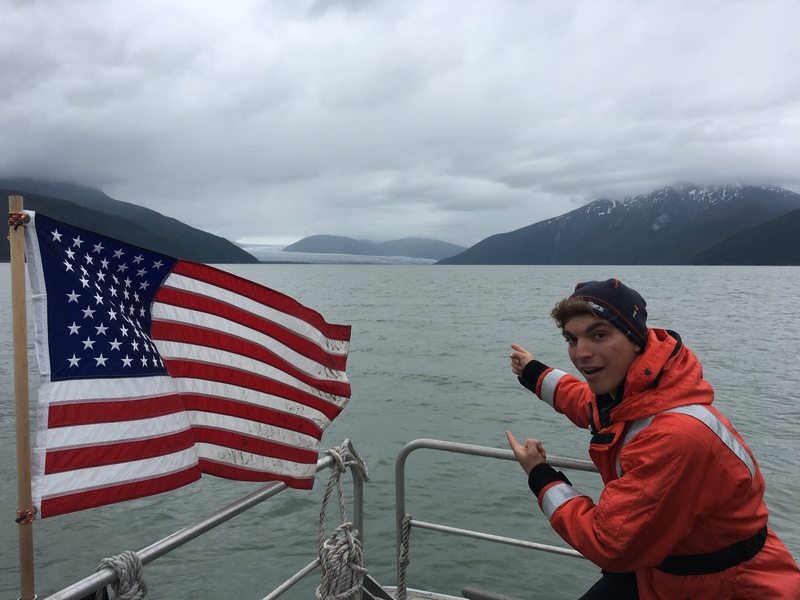 Another short term visitor on this ship is a college student from Loyola University Chicago, Paul Campion, who is on board doing an internship with NOAA. Each year NOAA accepts approximately 130 college sophomores into their two-year-long Hollings internship program to give students an opportunity to take part in research, gain job experience and see what NOAA does. While on board, Paul has been working with the survey team to learn how they do their work, as well as create his own project. 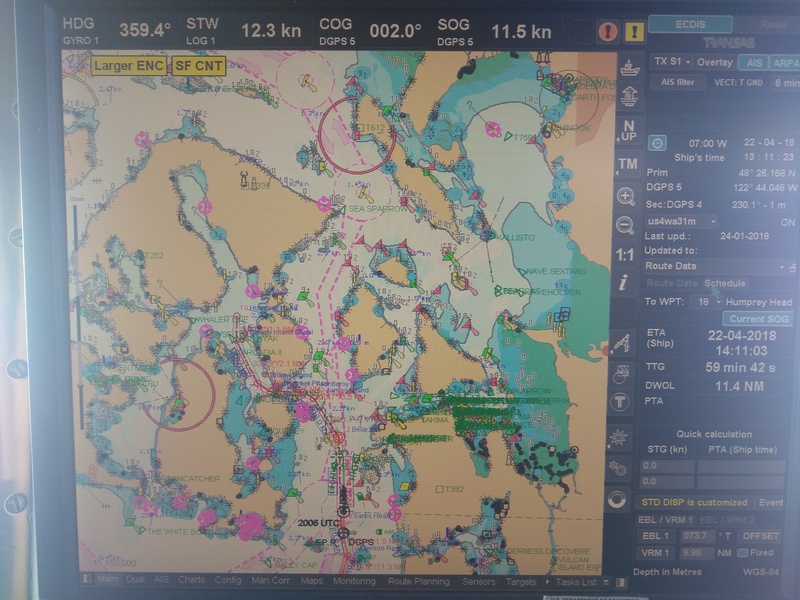 Paul has been looking at the electronic navigational charts (ENC) used today by most mariners which show the depth of the sea floor. As NOAA Ship Fairweather surveys an area, these ENC’s can then be updated with more accurate and up to date data. While some areas may remain the same, some areas may show changes or even characteristics which may not have been mapped prior and need to be highlighted. Paul has been working to help create an efficient way to show where the ENCs are different to the new NOAA Ship Fairweather data and may need to be altered or updated. Paul Campion pointing out a beautiful glacier! 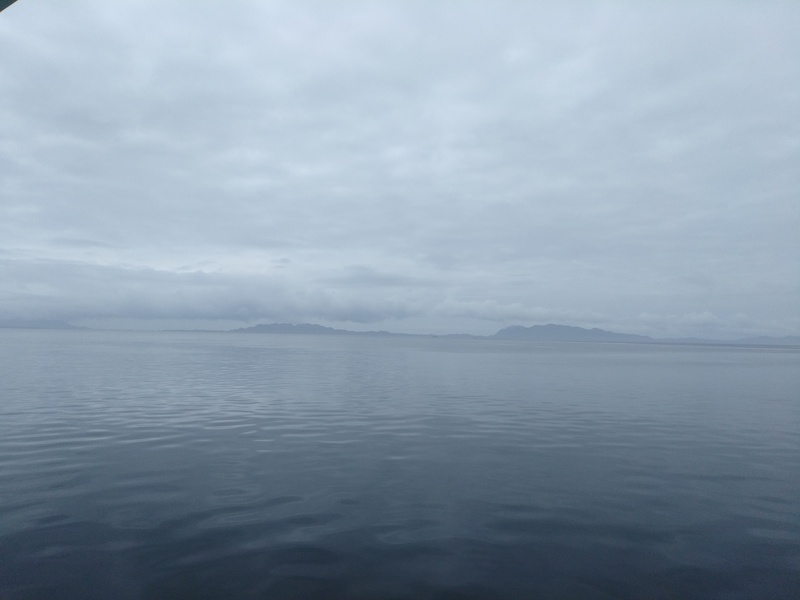 Since we are out in the sea, and do not have neighboring island chains around us, the boat has been tossed around a bit more and is definitely rolling around in the waves. Luckily, I have not been sick… yet. I have been taking sea sickness pills, and making sure I get plenty of fresh air, but the boat is definitely more difficult to work in. You find yourself moving both with the boat’s inertia and then having to fight against it to move. Walking uses walls and railings, sitting requires holding on to the closest counter top or nailed down object and to get into rooms you need to shove doors away from you to open them, yet hold on so they don’t swing completely away from you and slam the opposite wall. It is kind of challenging and yet amusing. After lunch today, I went to take a shower. I was given some good advice since I had not done this when the boat was in open water. These words of advice included: Use the walls, kind of squat down to lower your center of gravity, don’t take a razor with you (nothing good will come of that), and if the soap drops be especially careful! All things I took to heart and I am glad to report I am clean, unscratched and ready for another day. 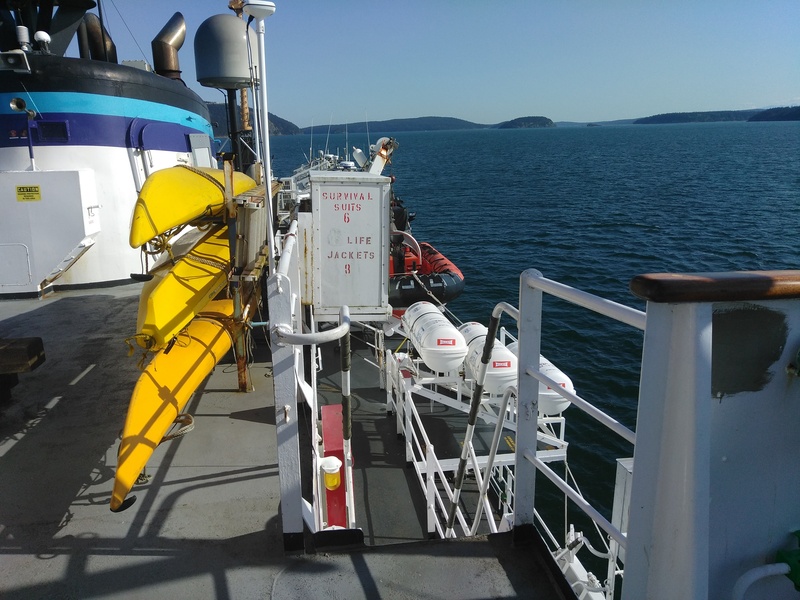 Today while in transit through the Inside Passage, I learned to mark the position of the vessel from the pilot house, or Bridge of the ship, using three different methods thanks to Junior Officer Airlie Pickett. 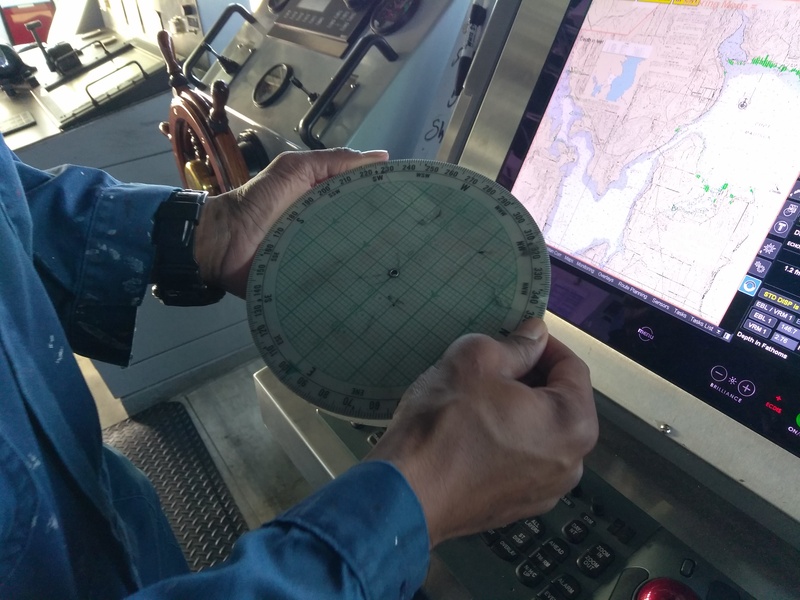 Utilizing this triangulation of data ensures accuracy in the placement of the ship on the two dimensional chart located on the port side of the bridge. This process must be completed every fifteen minutes when the ship is in motion close to small landmasses or every thirty minutes when further from land. The first method involves choosing three different landmarks and recording the angular measurement to the body using alidades. Alidades are located on the port and starboard sides directly outside of the Bridge. When looking at your landmark, it is important to choose the easternmost or westernmost side of the body with a more prominent feature. When viewing the landmass through the alidade, there will be a bearing of the object in relation to the bridge. Once you have the measurements, use the north lines on the map as the zero degree of the protractor and mark a line with the proper angular measurement from the landmass. Repeat this process for the other two locations. Then, draw a circle within the triangle formed from the three intersecting lines along with the time to mark the placement of the ship. Another way to mark the placement of the vessel visually is to look at the radar for three known landmarks. Record the distance to each landmark. One nautical mile equals one minute of latitude. Longitude cannot be used for distance since these values change as you approach the poles of the Earth. Use a compass to mark the appropriate distance from the scale on the perimeter of the map. Then, draw an arc with the compass from the landmass. Repeat this process for both of the other landmarks. The three arcs intersect at the current location of the vessel and should be marked with a circle and the time. Protractor and compass used to mark the course of the ship on the chart. The two visual methods for marking the placement of the vessel are used in conjunction with an electronic fix. The digital latitude and longitude recording from the G.P.S, or Global Positioning System, provides the third check. This data is recorded and then charted using the latitude and longitude marks on the perimeter of the chart. Another responsibility of the navigator is to mark on the nautical chart the approximate location of the ship moving forward. This is called D.R, or dead reckon, and it shows where you would be if you were to continue on coarse at the current speed for up to two hours. 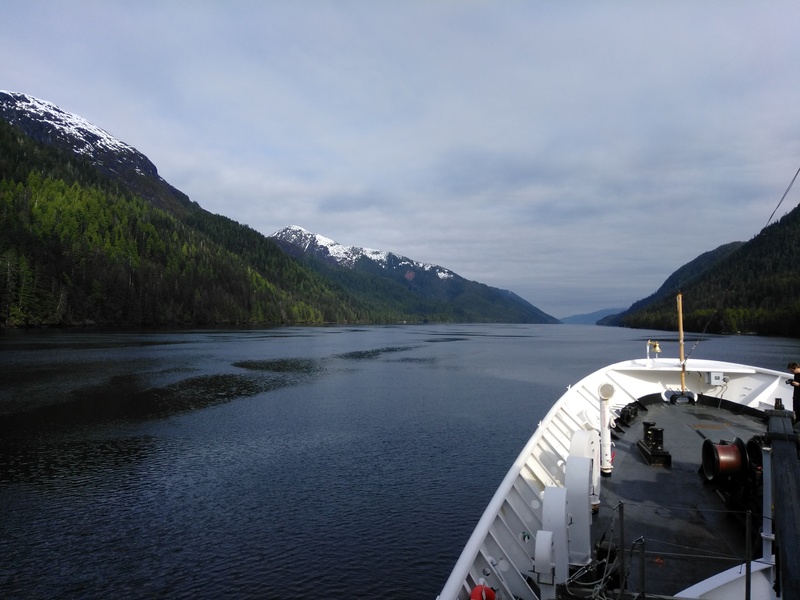 As we approached the Inside Passage, a feeling of peace and serenity came over me as I viewed snow capped mountains beyond islands with endless evergreen trees. The feelings of the navigators may be different since this is a treacherous journey to traverse, although it is preferred to the open sea. 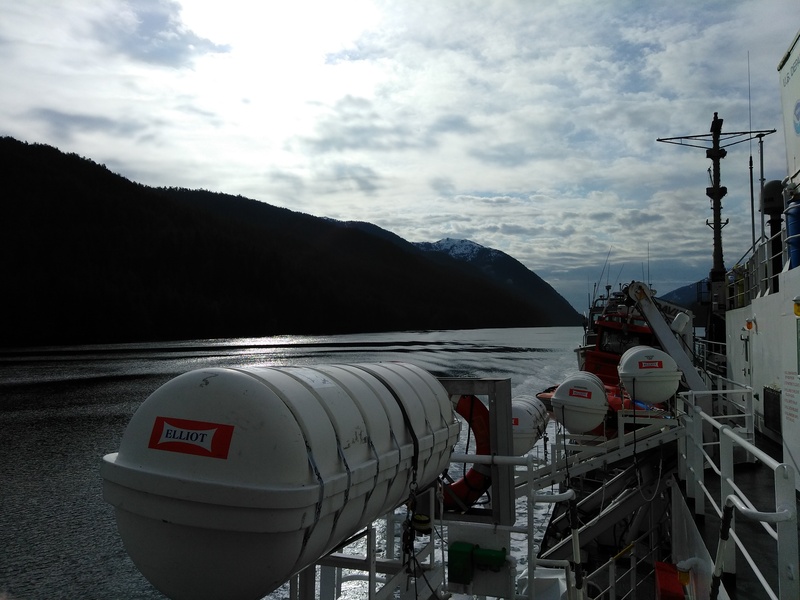 The Inside Passage proves to be a great learning opportunity for new junior officers without much navigation experience. 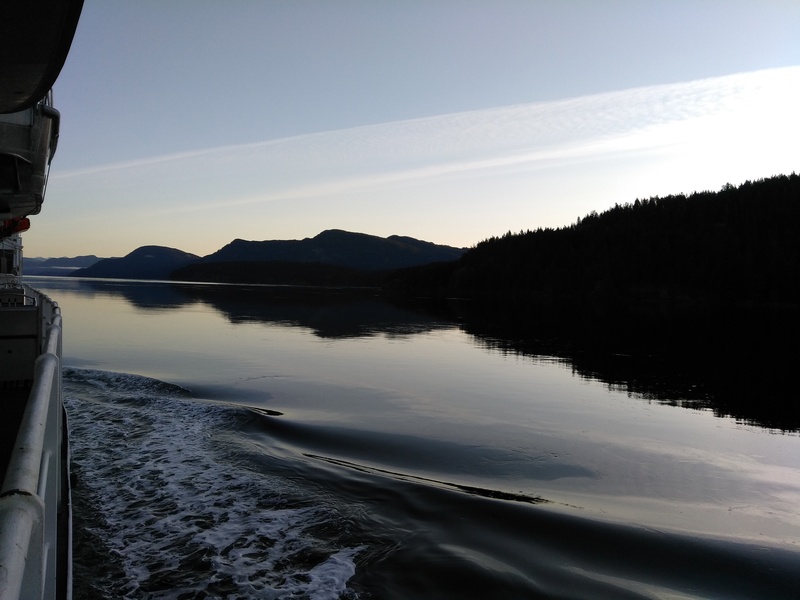 However, due to the weather issues and narrow passages, the Commanding Officer, Senior Watch Officer and Officer of the Deck have extended experience navigating the Inside Passage. 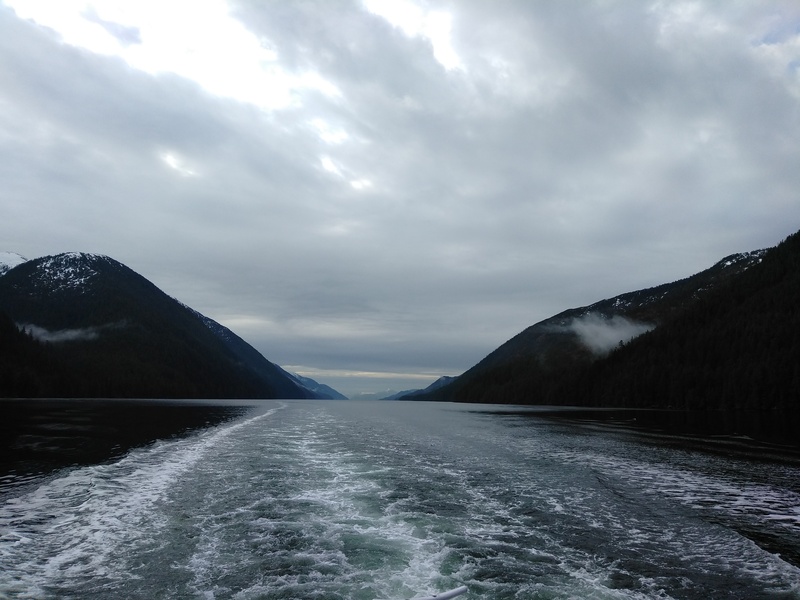 The strong currents at Seymour Narrows in British Columbia can make this voyage dangerous. This was taken into consideration and we crossed them during slack tide, the time between high and low tide, with a current of only about two knots. Tides can get as high as 15 knots during maximum ebb and flood tides. The visible circular tides, or eddies, are created from the current coming off of Vancouver Island being forced into a narrow channel. 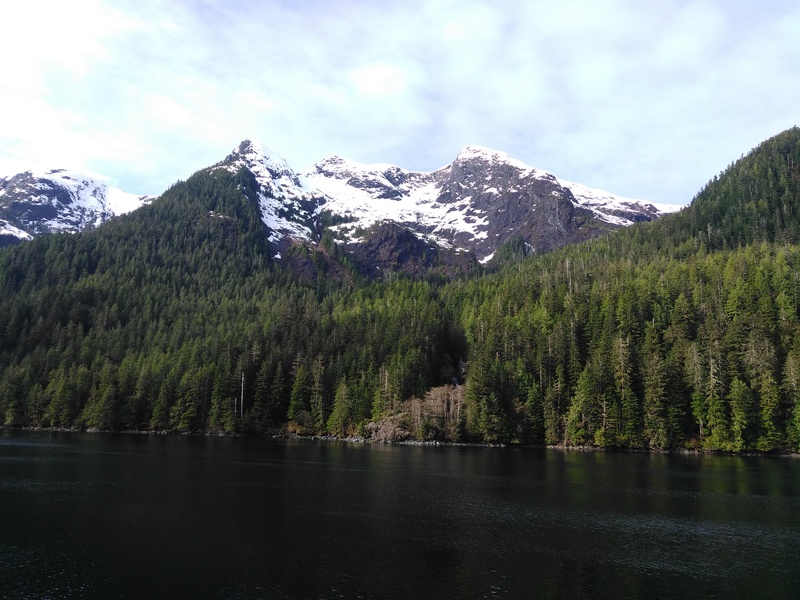 As Senior Survey Technician Jackson shared, the Seymour Narrows once had Ripple Rock, a two peak mountain, that caused several shipwrecks and was home to the largest non-nuclear explosion in North America in 1958. 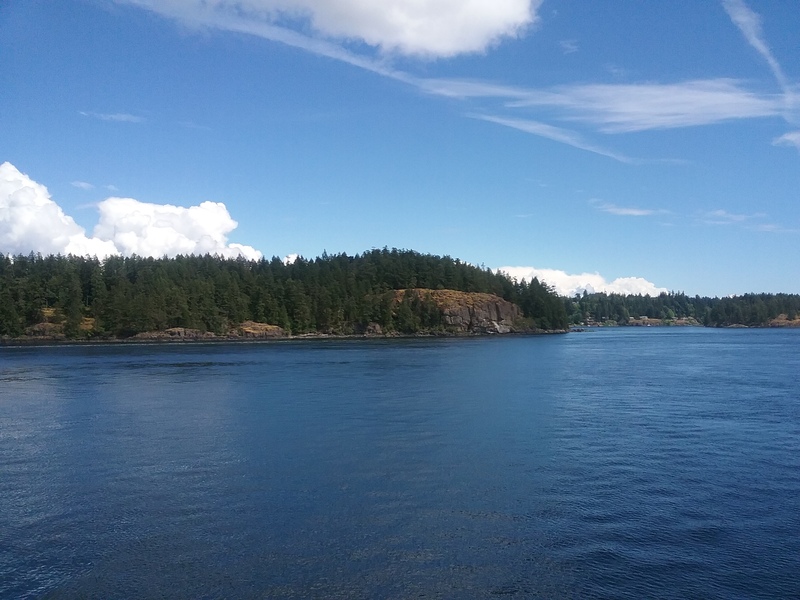 As we entered the Inside Passage, islands covered in Western red cedar, Sitka spruce and Western hemlock provided the beautiful green amongst the spectacular ocean and sky blue. These colors paint the canvas indicative of the Pacific Northwest that make my soul feel at home. The cloud covered sky could be seen in every direction. We saw moon jellyfish floating by from the flying bridge and later a group of porpoises jumping up out of the water. The watch from the deck crew would spot lighthouses and fishing boats with binoculars well before anyone with a naked eye. 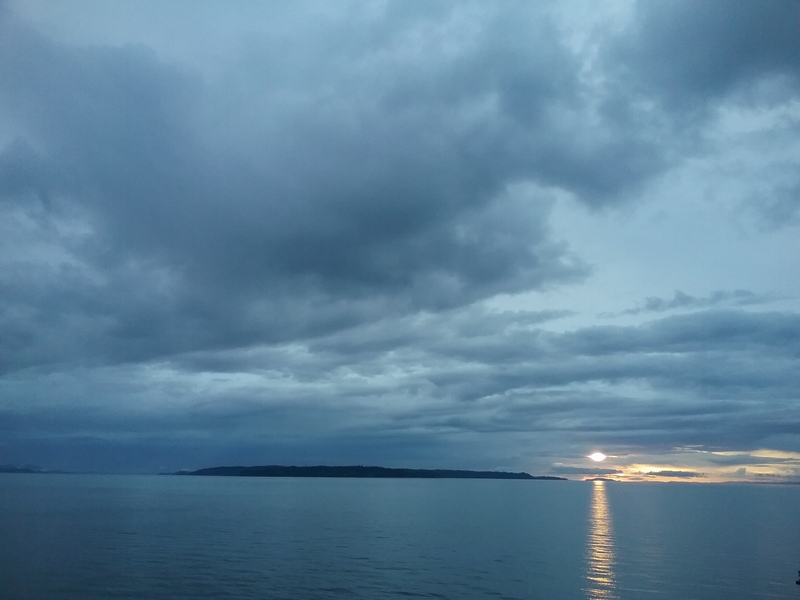 I observed the approaching sunset from the bow of the ship and felt gratitude for the day. There are two different types of radar on the Bridge. S Band radar sends out pulses between 4 and 8 centimeters at 2-4 GHz and can go over longer distances. This is helpful to determine what is happening far from the boat. The X Band radar sends out smaller pulses of 2.5 -4 cm at 8-12 GHertz and can create a clear image of what is occurring close to the boat. Both radar systems provide useful information and must be used in conjunction with one another to have an understanding of what is happening near and far from the ship. Today, we will be exploring all of the equipment we deliberately toss over the stern of the ship. 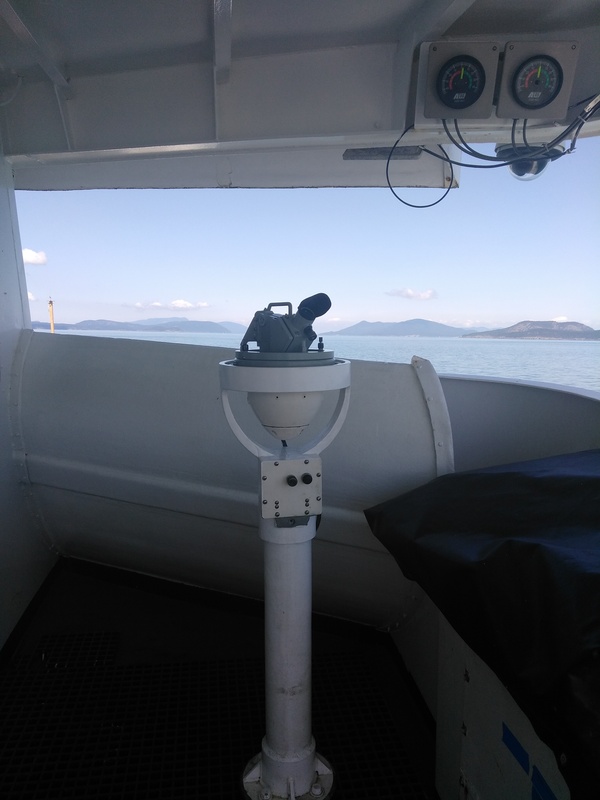 There are a number of different audio recorders that the HICEAS and other teams use to detect various species while underway. Chief scientist Erin Oleson gives a great perspective when she says that, “We pass through this particular area for this study only one time. Just because we may not see or hear an animal, it certainly doesn’t mean it’s not there, or that it won’t come by this area at a later time.” In order to compensate for the temporal restrictiveness of the ship being in one spot at one time, the team will periodically launch buoys over the side to continue the listening process for us. 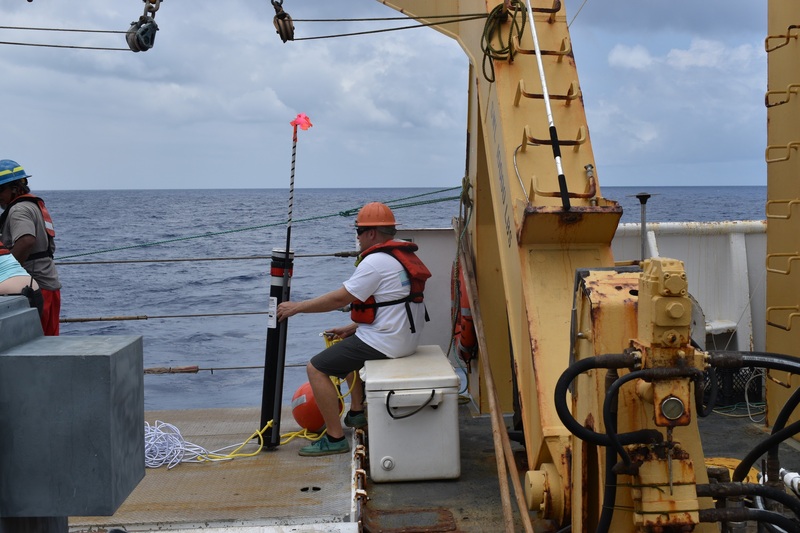 Some buoys are designed to last a few hours, some report the information real-time back to the ship, some are anchored to the ocean floor, some drift around, and all serve different needs for the scientific team. Since arriving on the ship, I have been recruited to “Team Sonobuoy” by the acoustics team for deployments! It is my job to program and launch two sonobuoys on a set schedule created by the scientific team. Sonobuoys are designed to pick up low-frequency sounds from 0 – 2 KHz, most often made by baleen whales. 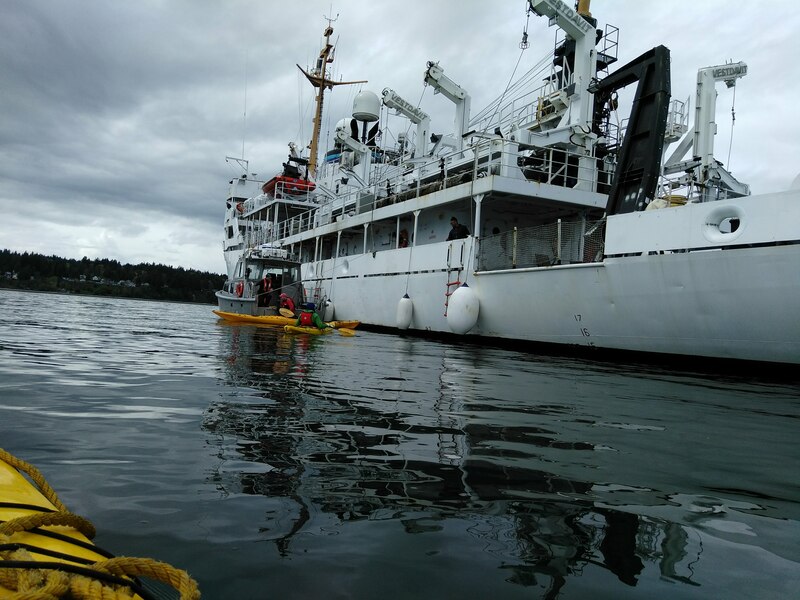 The sonobuoy will send information back to the ship in real-time. Once launched over the side, the sonobuoy will drift in the ocean, listening for these low frequency noises. They are a temporary acoustic tool – lasting anywhere from 30 mins to 8 hours of time. Most of the buoys are set to record for 8 full hours. After the pre-set recording time is up, the float on the buoy pops, and the buoy is no longer active. It is my job to launch two sonobuoys, and then monitor the signal coming back to the ship via VHF until we are too far away to detect the frequency coming back to us. This usually happens between 2 and 3 miles after launch. The recordings are sent onshore for processing. Fun fact: sonobuoys were originally developed by the Navy to listen for enemy submarines! The scientists thought they would be a handy tool for baleen whales, and picked up the technology. We have deployed sonobuoys almost every evening of the cruise. 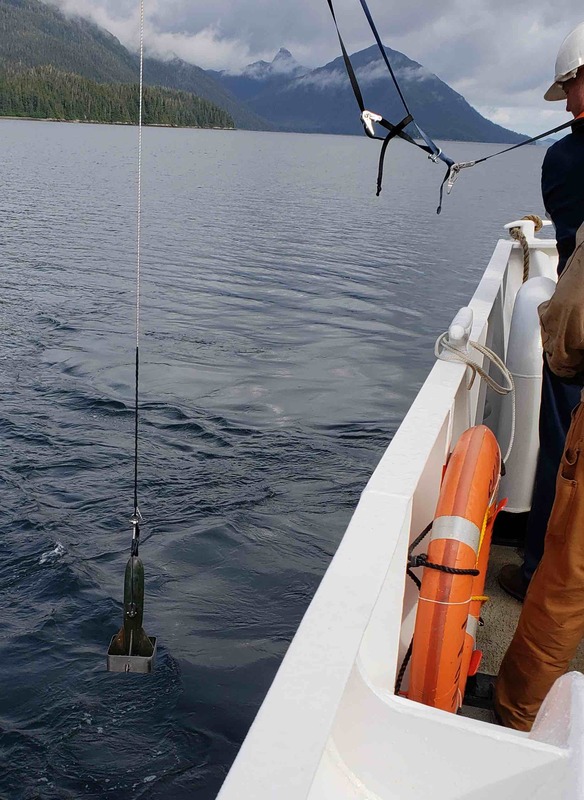 DASBRs, or Digital Acoustic Spar Buoy Recorders, are floating recorders launched at certain waypoints in the ocean. The word “spar” simply means that the buoy floats vertically in the water. There are two types of DASBRs, one records from 0 – 128 KHz, and one goes all the way from 0 – 144 KHz. Now, these particular buoys get launched, but they don’t get anchored. 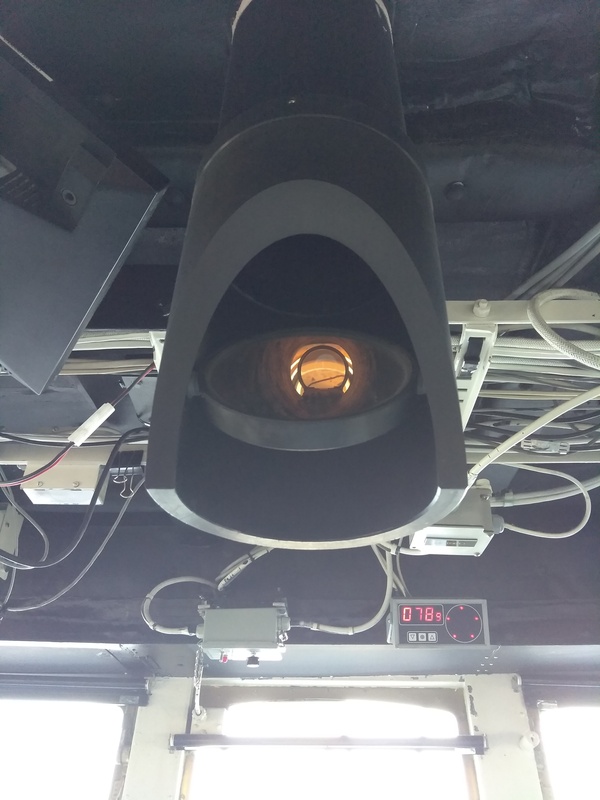 Inside the DASBR is a transmitter that shows the location of the buoy so that the scientific team can recover them at a later time. Erik waits to deploy the DASBR at the proper GPS location. So, in effect, this is a buoy we deliberately throw off the ship only to bring it back on after a predetermined amount of time. These recorders do not transmit back to the ship. They store all of the data on the DASBR, which is why recovery of the DASBRs is so important. A DASBR that does not get recovered keeps all of its secrets as it floats along in the ocean. We can track DASBRs real time, and they follow interesting patterns as they float freely in the ocean – some track in a given direction along with the current, while others corkscrew around in the same area. So far, we have deployed 4 DASBRs in the first 8 days of the cruise. HARPS, or High Frequency Acoustic Recording Packages, are the third type of microphone deployed off the ship. HARPS record all sounds between 0 and 100 KHz. 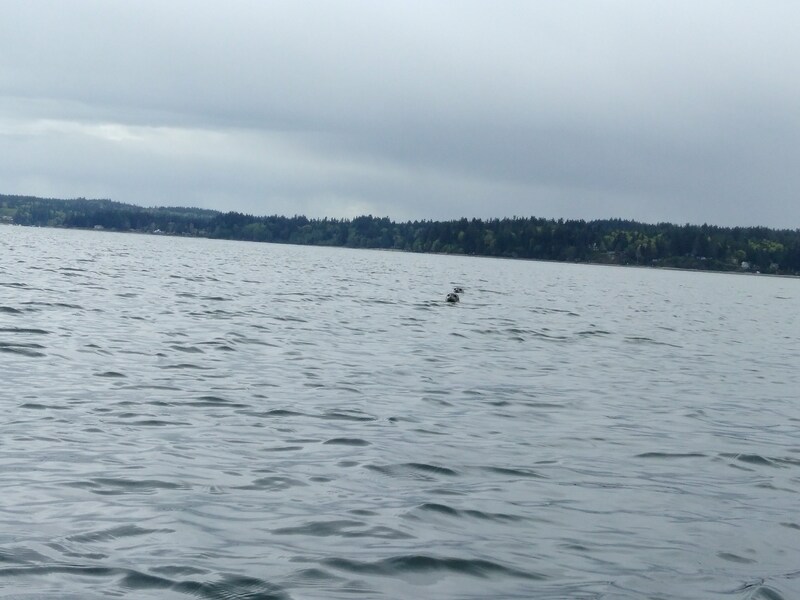 They last far longer than both sonobuoys and DASBRS in terms of time out on the water. They are limited not by data storage, but by battery power. HARPS are deployed at one location and are anchored to the ocean floor. 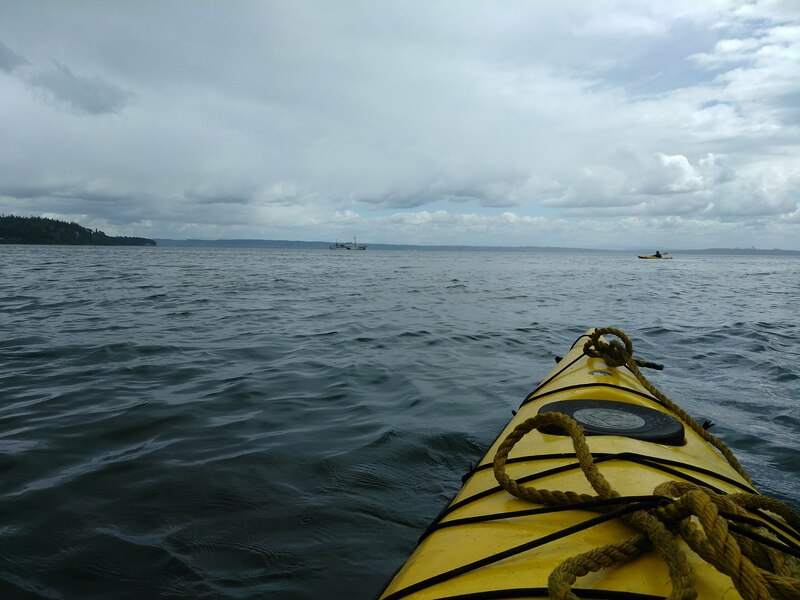 Small yellow floats rise to the surface to alert ships and other traffic to their presence. They are a little easier to find when it comes to recovery, since they have a GPS known location and are secured to the ocean floor, but they are a little more difficult to wrangle on to the back deck of the ship when recovered and deployed, since there is an anchor associated with them. The HARP in the Wet Lab undergoing repairs before launch. On this cruise we have both recovered and deployed HARP systems. The HARPS also store information within the HARP, so recovery is important to the scientific team because the data does not get transmitted in real time back to any computers. There are data recorders that record the level of noise in the ocean over time. We are currently on our way to pick one of these recorders up, complete some maintenance on it, and re-deploy it. This will be a full day commitment for the scientific team and the crew, so I’m going to keep you guessing on this one until we actually complete this part of the operation. We have many hands working together both on the ship and between organizations to make the ocean noise-monitoring program effective and cohesive, so this section of “Things we deliberately throw off the ship” will get its own blog post in the future as we complete the haul in, maintenance, and re-deployment. Stay tuned. Team. You’ll never guess what I did. I. Drove. The Ship. Yes, you read that correctly. I drove the ship, and – AND – I didn’t hit anything while I did it! What’s better is that I didn’t tip anyone out of their chairs while I made turns, either! This is cause for much celebration and rejoicing among scientists and crew alike. The Commanding Officer, CDR Stephanie Koes invited me, “Spaz the TAS” up to the bridge for a little steering lesson two days ago, in which I happily obliged. 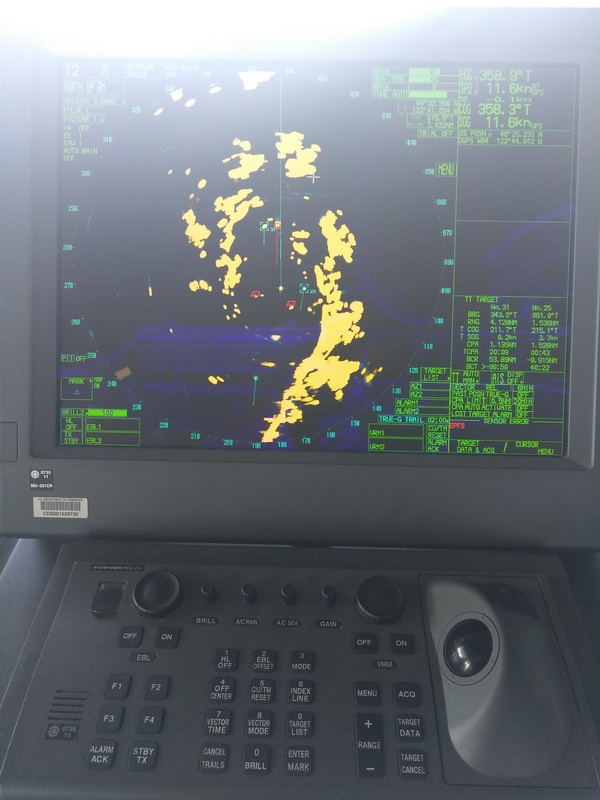 ENS Fredrick gave me a little mini-lesson on the onboard radar systems, which were picking up rain just off our starboard side. I also learned of the existence of the many GPS positioning systems and navigation systems onboard. The NOAA Marine and Aviation Operations, or OMAO, is not lost on system redundancies. From what I can surmise, there are two of everything on the bridge in order to ensure the NOAA OMAO’s number one priority – safety. 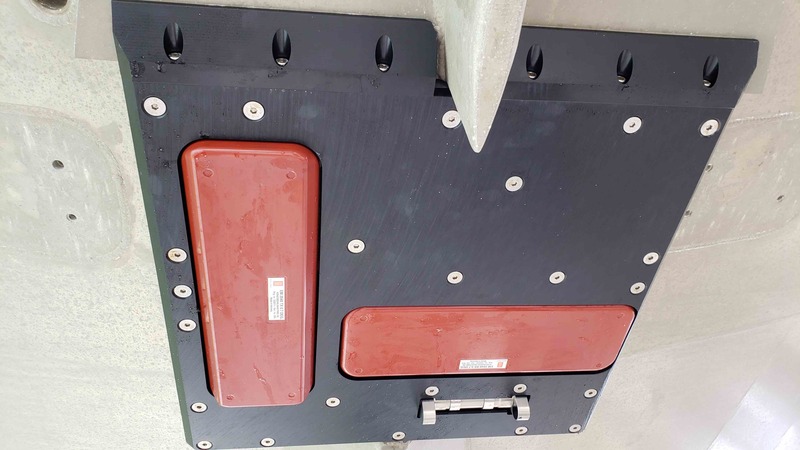 Everything on the bridge has a backup, or in many instances, a preferential option for each officer responsible for the bridge at any given time. Some systems are fancy and new, while others maintain tradition on the bridge. For example, a bell will still chime every half hour to remind the watch stander to record weather data on the bridge and a navigational fix on a paper chart. 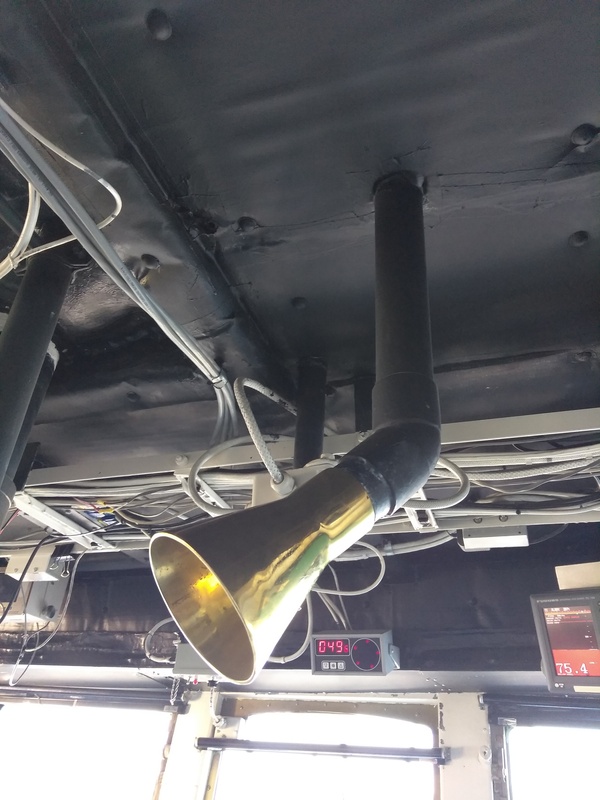 ENS Fredrick says that the bell is an older maritime system, but is very handy when things get busy on the bridge – the bell ringing is a perfect audio cue for him to stop what he’s doing and get to the logbook to record the weather. Turning a giant ship sounds difficult, but in reality, it’s really difficult. The actual act of turning doesn’t take much – a simple flip of a switch to take the ship off what I termed “cruise control” and a turn of the wheel (which by the way looks exactly like a smaller version of the ship wheels you see in all of the fabulous movies – I’m looking at you, Goonies) and an eye on the bearing angle (the compass direction in which the ship is headed). But here’s the real issue – this moving city technically has no brakes. So as the ship begins to turn, the driver has to pull the rudder back in the opposite direction before the bearing angle is reached, otherwise the bearing angle gets overshot. If you turn the wheel too far one way or the other too quickly, the ship responds by “leaning into” the turn at a steep angle. This is me not running in to things while steering the ship with ENS Fredrick! This sounds like it might be fun until the chef downstairs rings the bridge and chews the driver out for making the cheesecake fall off the galley countertop. Then the driver must take the heat for ruining the cheesecake for everyone else on the ship waiting quite impatiently to eat it. Thankfully, I tipped no cheesecakes. That would make for a long month onboard being “that guy who turned the ship too hard and ruined dessert for everyone.” I’m pretty sure had I not had the direction of ENS Fredrick as to when and how far to turn the rudder, I’d be in the dessert doghouse. 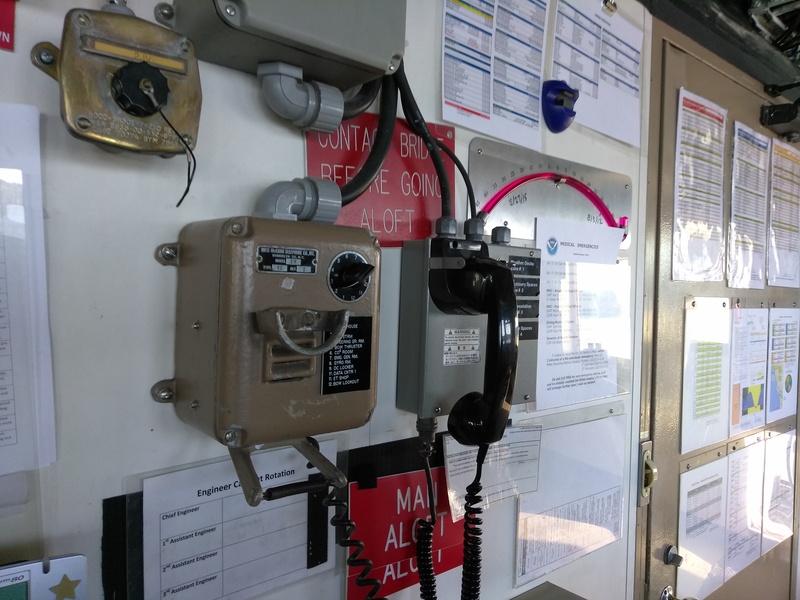 Another fabulous part of turning the ship is that I got to use the radio to tell the flying bridge (and anyone else who was listening) that I had actually turned the ship and it was correctly on course. Luckily I had been listening to the radio communication for a few days and put on my best radio voice to make said announcements. I think my performance was middling to above average at least, and fully qualified to speak on the radio without sounding too unfortunate at best. However, there was one element of driving the ship that made me terrified enough to realize that I probably am not quite ready to hack the job – everything else that is going on up on the bridge while you are keeping the ship on-course. Watch standers are notoriously good at keeping data. They record every move the ship makes. If the mammal and bird team go off effort due to weather or too high of a Beaufort state, the bridge records it. They also record when they go back on effort. They log every turn and adjustment the ship makes. They log every time we deploy a CTD or any kind of buoy. I watched the watch stander on the bridge take a phone call, make a turn, log the turn, put the mammal team off-effort, put the mammal team back on-effort, take a request on the radio and record weather data all in a span of about two minutes. It seemed like everything was happening all at once, and he managed it all like it was just another day in the office. For him, it was. 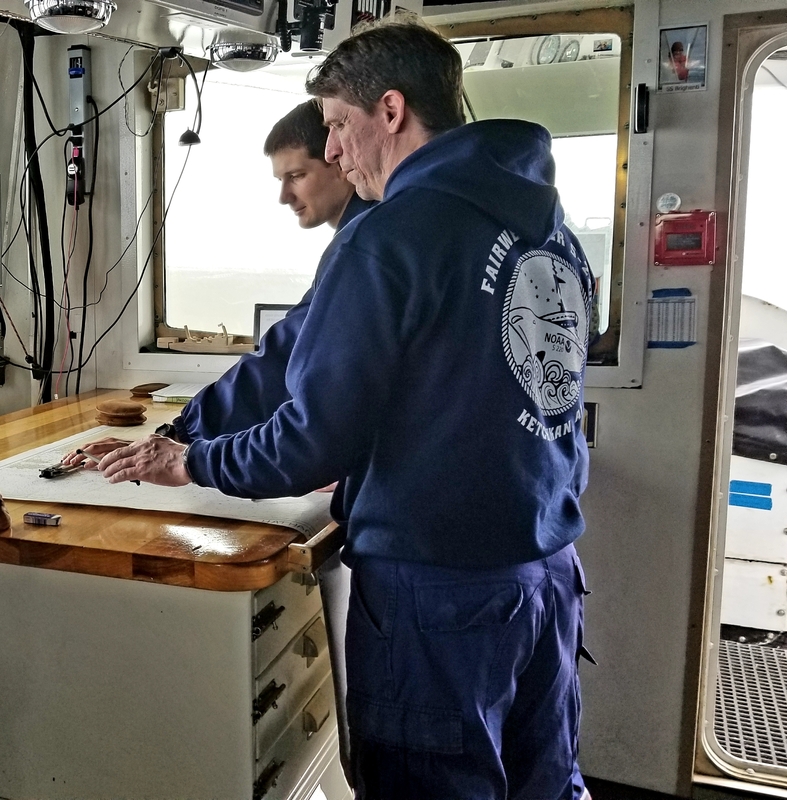 To be a member of the NOAA OMAO means that you must be willing to learn, willing to make mistakes, willing to follow orders, willing to be flexible, and willing to be one heck of a multi-tasker. I, for one, went quickly cross-eyed at all of the information processing that must happen up on the bridge during an officer’s shift. Thankfully, I didn’t go cross-eyed while I was trying to turn the ship. That would have been bad, especially for cheesecakes. I’m thinking that if I play my cards right, I can enlist as a “backup ship driver” for future shifts on Oscar Elton Sette. I figure you never know when you might need someone fully unqualified to steer a giant moving city in a general direction for any given amount of time. But I think I can do it if I do it like the NOAA Corps – taking everything one turn at a time. A juvenile Red-Footed Booby takes a two day rest on Sette‘s Mast. 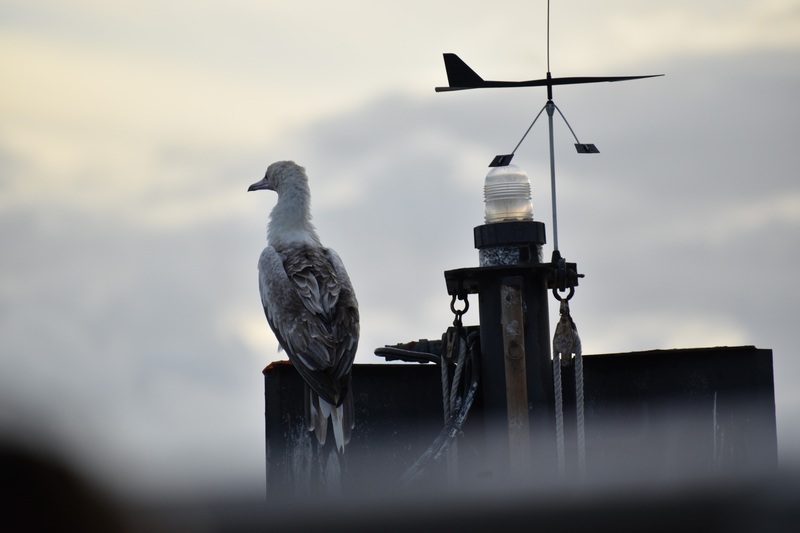 A juvenile Red-Footed Booby who has taken up residence on the mast of the ship for two full days and pretends to fly from the mast – highly entertaining.